15th March - another Breezy Saturday! Annabel does it !! World Champion !! 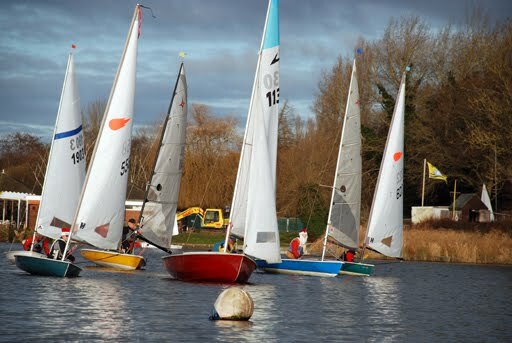 Despite the chilly weather and gusty wind conditions, we have had very good support from our members with 11 or 12 dinghies taking to the water in recent weekends. On 5th March, Brian Cardinal and David Brown saw a Kingfisher arrive briefly in the bushes below the race hut before taking off and darting further along the lakeside. It didn't wait for a photograph but we feel it could be a cousin of the this one. Very few have been seen recently and we hope this might herald their return to the area. 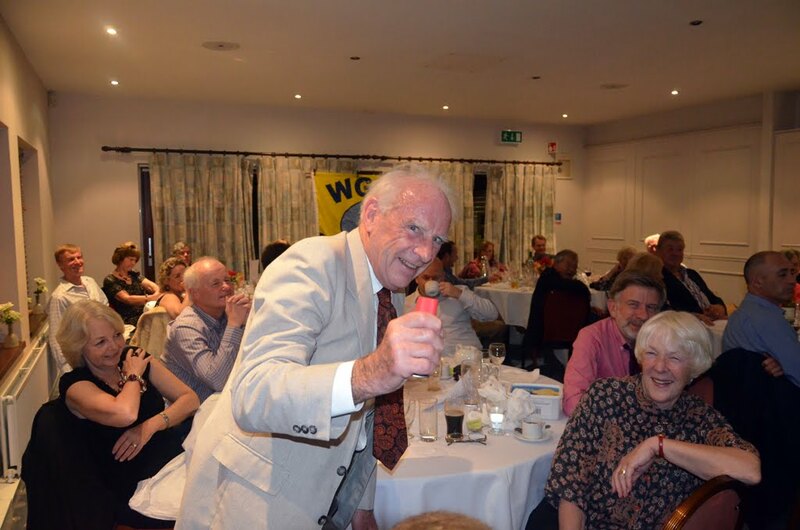 WGC sailors raised nearly £200 for the Noah’s Ark Children’s Hospice at this year’s Welly Challenge, the club’s annual anarchic evening of fun held, as usual, at the Mead Hall, Wheathamstead. The theme was: ‘celebrating around the world’, and our irrepressible master of ceremonies Roger Morse, introduced a cavalcade of unlikely characters from many nations. They included two Aussies with corks on their hats and tinnies in hand, two beautiful Japanese ladies with parasols, an elegant sari-clad Indian lady, a Caribbean pirate, two fez-wearing Turks, a Canadian lumberjack, a kilted Scot, a sheik from Dubai, a Peruvian peasant, an Austrian skier, a white bearded old man from Lapland, a couple of Irish citizens, numerous assorted English and inexplicably, a nurse and doctor from Medicins Sans Frontieres. The fast and slow handicap fleets competed against each other in a series of brain curdling quizzes and chaotic competitions. These included plank racing, and ‘Guess That Tune’ played by team line-ups blowing tin whistles, conducted by vice commodore, Nigel Davis. The final tally was 84-96, which gave the slow fleet sailors an emphatic win. In time honoured fashion, this drew an ungracious but good humoured response from the fast fleet. To view all Val's photographs of the event in a separate window, click here. 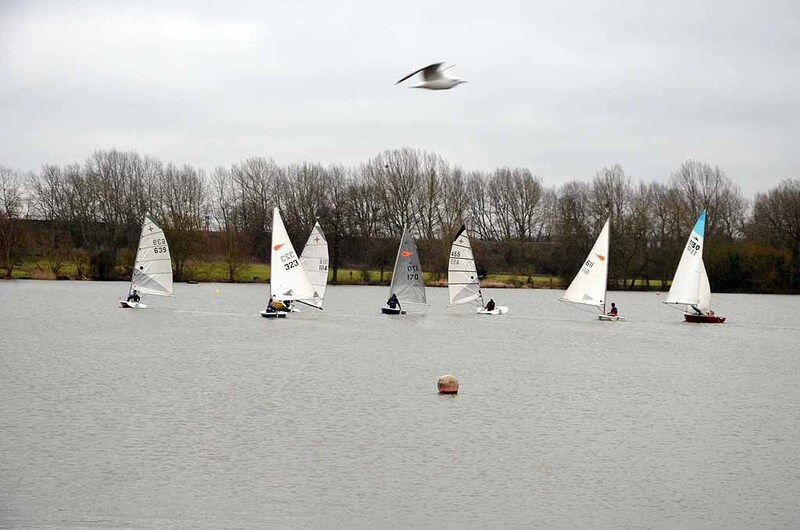 Twelve boats competed in the 2015 Christmas Pud Regatta on December 19. Conditions were just about perfect. It was bright 'n' breezy and the sun even managed to shine. Two of our newest sailors - Paul McAlister (Comet 554) and junior, Sam Clayton (Comet Swan Song) - were brave enough to launch into battle against the regulars, and thoroughly enjoyed the experience. Fast fleet: 1st Roger Morse (Leader 1130), 2nd David Lambert (Supernova 1114). As always, a jolly gathering of club members past and present enjoying the event, and the morning was rounded off with delicious hot mulled wine and mince pies, kindly provided by Marjorie Adams. Thanks to OOD Ray Wilson, AOD Ian Stringer, Rescue Driver Tim Hogan, and Rescue Assistant Peter Edel for running the race. Click here to see all the Christmas Pud photographs in a new window. 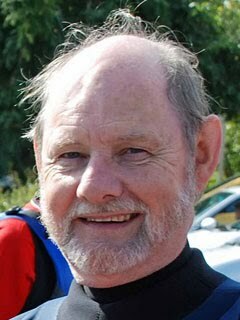 (Peter Thornley writes:) The weather was bright with a chilly northerly wind for the 2015 Commodore's Cup, which consists of 2 mixed fleet handicap races. It must have been an auspicious day, with heavenly bodies and a divine intervention featuring prominently. 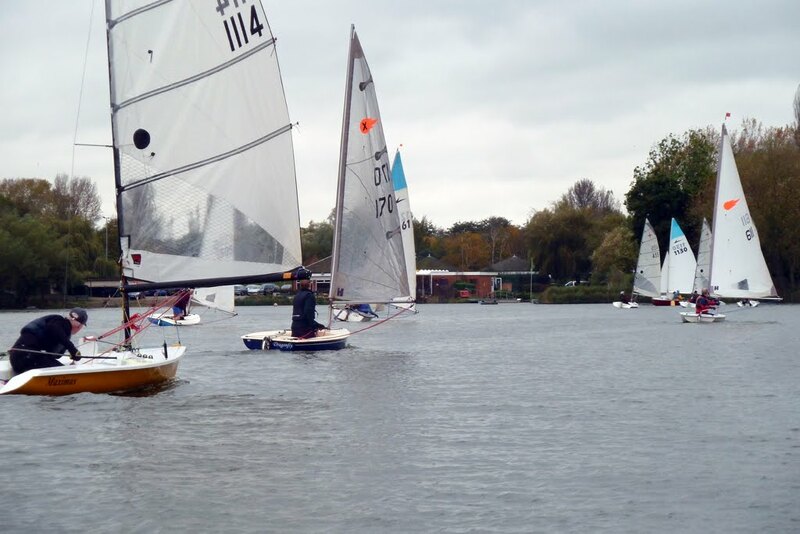 The wind direction allowed a rare windward start, with the start line from the moored pontoon in the centre of the lake to the west bank, and a beat up to the car park end. In the first race, Dave Lambert got away smartly in his Supernova to lead for a lap, until he went the wrong way round a mark and was swamped by the fleet before he had corrected his error. He recovered to fifth place. The wind was variable in strength from a drifter to 10mph, and we had the usual fluky bits near the banks. These conditions favoured the slow fleet sailors, resulting in Charles Adams winning in his Miracle, followed by Annette Walter and Sheila Stowe in Comets. There was a minor mark position change for the second race to help keep the boats separated. 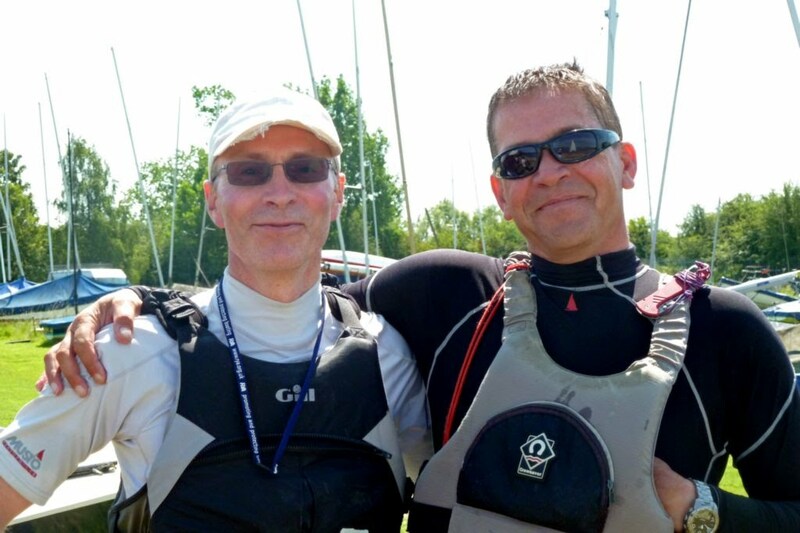 Dave and Shaun Smale made excellent starts in their Supernovas, and kept ahead of the fleet for the whole race. 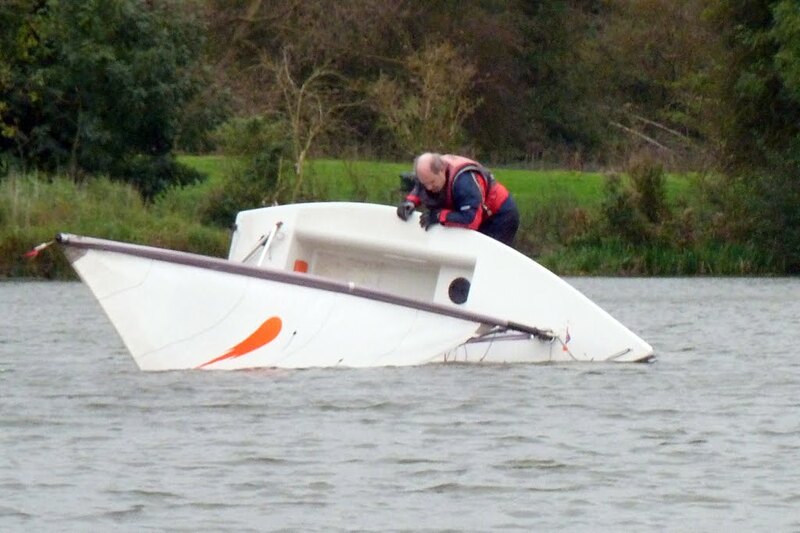 A boat pile-up at a downwind mark unfortunately caused Sheila to capsize through no fault of her own. She lost too much time and retired. This time the fast boats sailed better, but not enough to beat Annette, who took first, followed by Shaun and Dave in their Supernovas. Overall winner was Annette, second was Charles, and third was Dave, who all won bottles of wine. "How WGCSC repelled the Spanish Armada"
Roger contemplating how well WGCSC had done to beat the Armada. 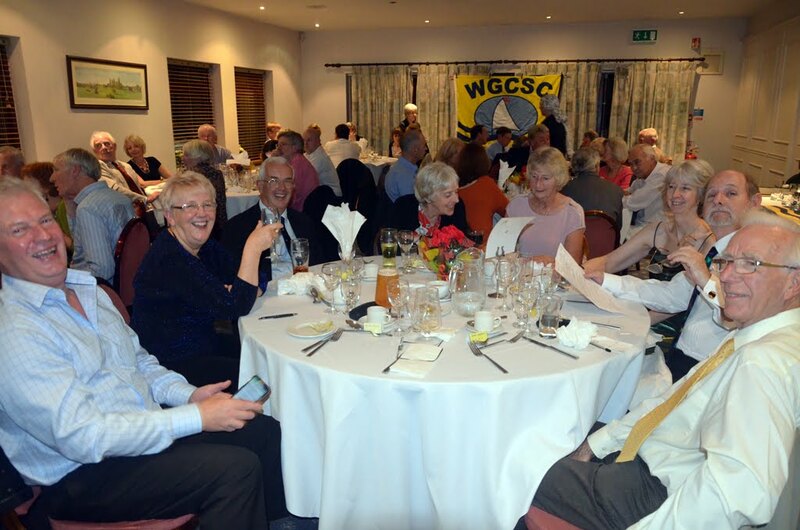 The Annual Dinner, which followed a very interesting Commodore’s Cup Race in the morning, was held at the WGC Golf Club. After an excellent dinner enjoyed by all, Roger Morse took the floor to entertain us with his story about the Spanish Armada and how WGCSC saved the day by chasing the Armada back to the south coast. Roger recruited Lin Smale as Cheer Leader, or rather as "Boo, Hiss and Cheer" Leader, to coordinate the audience's response to the highs and lows of the Armada's invasion and its subsequent defeat. To mark WGCSC's victory, Roger proposed the toast to the club. Thanks were expressed to our Commodore, Peter Thornley, for organising much of the event, and also to Shaun Smale, Sheila Stowe and Val Newton for the quizzes, table decorations and slideshow. The sale of raffle tickets was ably carried out by Samuel McAlister, Nash Gabbey and Christopher Ansell who carried out this task with great enthusiasm. If you cannot see the slideshow, click here to view it in a separate tab or window. Congratulations to Annette Walter and Michael Ettershank, who won this year’s WGCSC Punch Bowl in Comet 323 ‘Satin Doll’. Mike is a top ranking competitor on the Comet circuit, so the result is probably no surprise, given the combined talents of the two of them. Mike normally favours heavy conditions which were absent on this occasion, but they quickly took the lead and consolidated it with some very slick change overs. The trophy was presented to them by Commodore Peter Thornley. It was a gloriously sunny day but the wind was very light and sometimes non-existent, providing some interesting challenges for the six competing boats. During the morning, there was a fierce battle between the two Supernovas (David Lambert/Peter Edel) and (Alan Campbell/Dave Campbell). They changed places constantly and the final placing was only decided when the hooter went as David L and Peter were in the lead. There was also a ‘race within a race’ between the Miracle (Charles Adams/ Peter Thornley) and the Leader (Tony Hale/ Justin Bell), with the Miracle taking the honours decisively. The junior team of Josephine Clayton/Holly Clayton, in an RS Qba, enjoyed some fun change overs, and were warmly applauded for their efforts by everyone at the final presentation. It was good to see Peter Edel again after a long absence. He arrived with the beautifully polished Punch Bowl trophy which he won last year, but alas was not to take home this year! WGCSC was represented by Shaun Smale at the Supernova Nationals and he reports here on his experience and his very creditable progress throughout the weekend. I had a great time at Paignton last weekend for the the Supernova Nationals. Not sure the old bones would survive - it was kill or cure! The boats were on the green in front of my B&B and we were able get straight on to the beach from there. Weather was great. Now to the sailing. A mixed result coming 17th in the Masters and 46th out of 67 overall. Best places 17th and 21st. First race had an on-shore wind and I had no idea where the windward mark was; and don’t say windward. The second windward mark was even harder to find. I struggled to get speed on the start line without running parallel to it. I made up some place and was in the 40s on the first rounding, but valiantly fought my way to the back to come 60th. The next 2 races I improved to 52nd and 55th. Conclusion I went the very long way round. That night was boat turning, last year's champion had me move the mast step forward and and rake the mast back 20cm!! did it help? Lot of weather helm, other wise difficult to tell and the mast is raked on the run any way. The wind changed to off-shore and I tried to a new tactic for the second day. Straight on to port and clear air, pinch and tacking Stanborough style with the shore line as a visual for the lift etc. Much better. The wind built for the last race and I was in the top 10 heading for the windward mark. Unfortunately I was the only boat on the port side of the course and got flattened 3 time in a row as a 25mph gust blew though. The gust had died down by the time it reach the others and they got a big lift to the mark nocking me back 20 place to finish 41st. I was also pushed close the windward mark and hit it in this race. It is much easer if you can dump the main and the boom swings over the mark! I think I was in the right but I did my turns any way. Last day, strong off-shore breeze, tactics sorted. Ducked through the fleet on a fast port tack on the start into clear air and had the port side of the course to myself. Approaching the first windward mark in 2nd place but not enough over lap to tack in front of the 3rd boat, who made me over-stand the mark. I don’t do that sort of tactics I was just happy to be there. Anyway 3rd around the mark. Lost places on the runs, 4 in the last few yard before the finish coming in at 17th. I also hit the mark and drop the tiller on a near death roll, adding two 360s in the mix. Must learn how to do waves next year. Next race was a discard or disgrace depending on how you look at it. I missed the start by nearly 3 mins! It is very hard to get any speed and point toward the line after 67 boats have stirred up the air. Happy with the last race. Forced to stay on the starboard tack off the line I could not clear the pack. However it was very windy and so most were starting the easy their mainsheet, but I was able to keep the power on the beats and made a lot of places, even past the last years champion!. Still loosing most place on the runs, to come in 21st. Looking forward to next year and the 20th anniversary of the Supernova association. There was a drone camera but I have not see any picture yet. Congratulations! 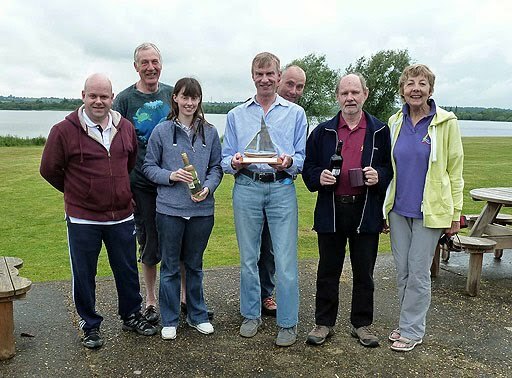 Our team succeeded in winning back the ‘WGCSC vs SWSC Sailing Match Trophy’ at the inter-club competition with Stewartby sailing club on Saturday 20th June. The seven-strong team were: (l-r) Graham Hunt (Comet), Charles Adams (Aero), Annette Walter (Comet), Nigel Davis (Comet), Julian Gunnell (Phantom), Phil Walter (Comet), and Val Newton (Laser Radial). FULL RACE RESULTS can be found here. 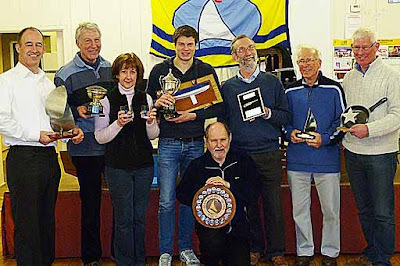 The WGCSC vs SWSC Sailing Match was inaugurated in 2008 by WGCSC and the winner of the trophy is the team that scores best overall in the match between the WGC and Stewartby teams at the annual awayday at Stewartby. WGCSC won the trophy in that first year, but has not done so since… until last week! I have not been to Stewartby before, but was impressed by the friendliness and hospitality of the people there; they delayed the start to ensure we all got there through the unexpected traffic jams, Gerry Howcroft, Commodore of SWSC, made sure we all knew the layout of the marks and the race procedures, and they generously loaned a club laser to Val. Lunches were also great, but the Stewartby support team was matched in numbers and enthusiasm by our own wonderful band of supporters Marjorie, Cheryl, Brian & Thelma, David C and sister Morag. The weather was warm, but grey and it rained at times. The wind was force 1-2, but faded to almost nothing at times; the second race was nearly abandoned, but the wind returned just in time. Stewartby is a big lake and I expected that to favour the locals. However, curiously the race officer placed the windward mark (two in the second race!) in the wind shadow of the trees, which probably helped us, as we are used to that every week. The Stewartby sailors generally had faster boats than us, so it was difficult to judge how well we were doing on the water, but when the handicaps were calculated it became clear that we had done very well. The overall winner was Annette, with Julian third, Phil fourth and Graham fifth. Graham sailed an amazing second race in which he was second only to Annette. The rest of us helped fill up the middle rankings and overall we won by a substantial margin. The Stewartby folk were very gracious in defeat and we look forward to seeing them again for another very pleasant day of racing next year. 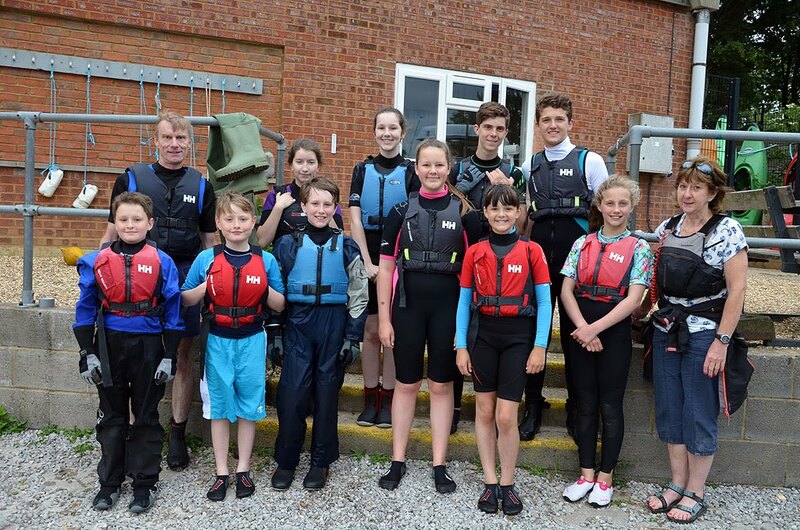 This enthusiastic bunch of juniors had a great time sailing simple courses and practising race starts on Wednesday 17th June, guided by Nigel Davis, vice commodore, and club member Sheila Stowe. Back row: Kirsty Selwood, Milly McAlister, Jack Miller, George Ball. Front row: Nash Gabbey, Alfie Mullin, Samuel McAlister, Josephine Clayton, Holly Clayton, Daisy Ball. The Wednesday evening sessions are from 6-8pm and run until the end of August. Turn up on the evening. Some sailing experience needed. 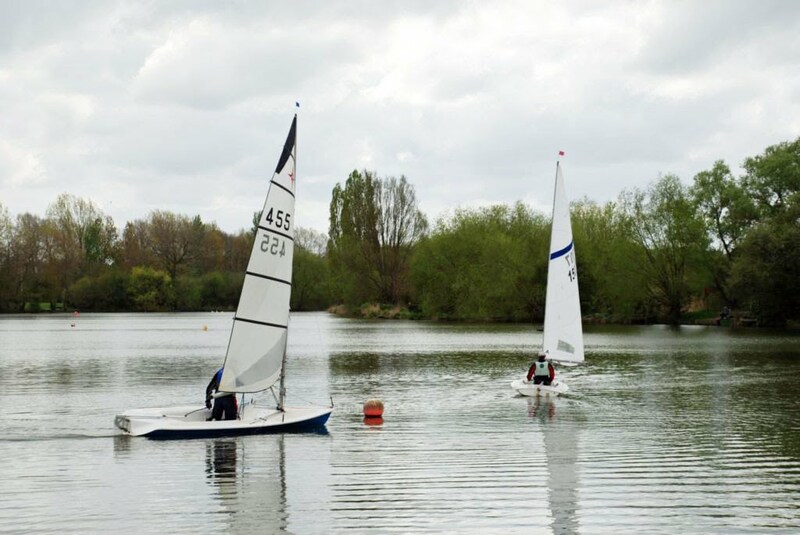 TWO local schoolgirls - Josephine and Holly Clayton – were the first to take advantage of Welwyn Garden City sailing club’s new Wednesday evening improver sessions which started this week (27 May). 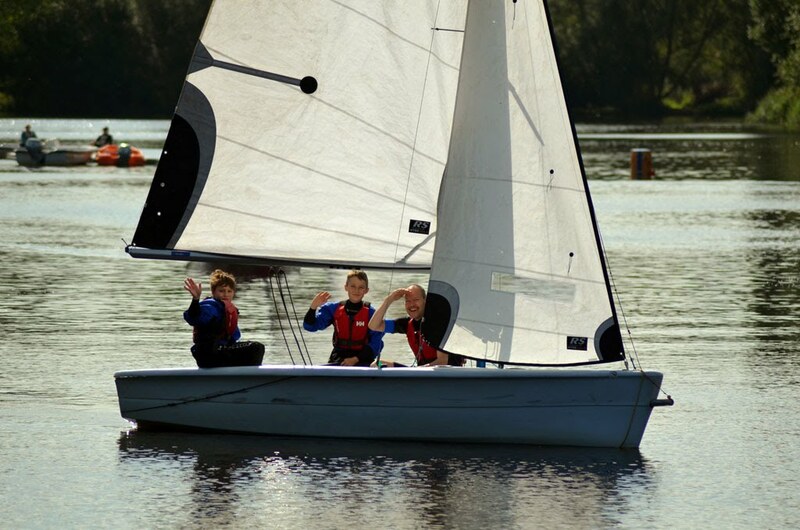 Josephine, 12, a student at Stanborough School and Holly, 10, who is at Applecroft, enjoyed a couple of hours sailing simple courses in an RS Quba dinghy on Stanborough Lake. 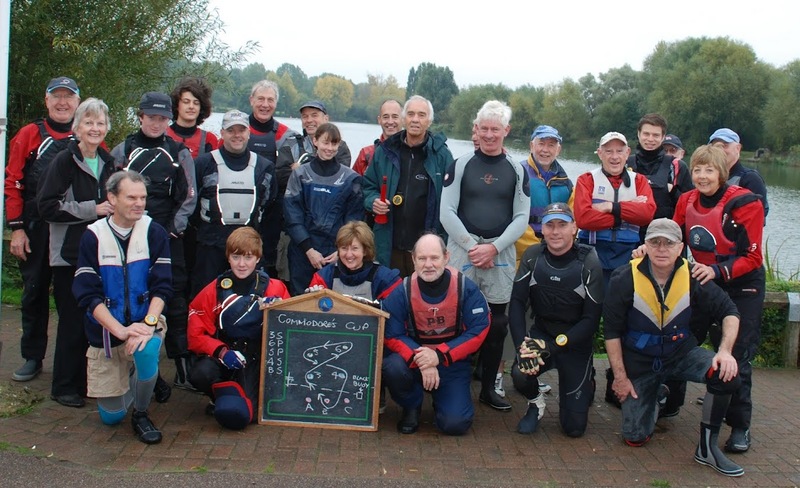 They were supported and encouraged by vice commodore Nigel Davis and club member Sheila Stowe in an accompanying powerboat. The informal sessions are being run every Wednesday from 6pm to 8pm, through to the end of August. Holly and Josephine, and their Mum, Alison, before the start of the session. Nigel Davis and Brian Cardinal were on hand to get them afloat. Sheila Stowe (not in pic) was busy getting the rescue boat ready. 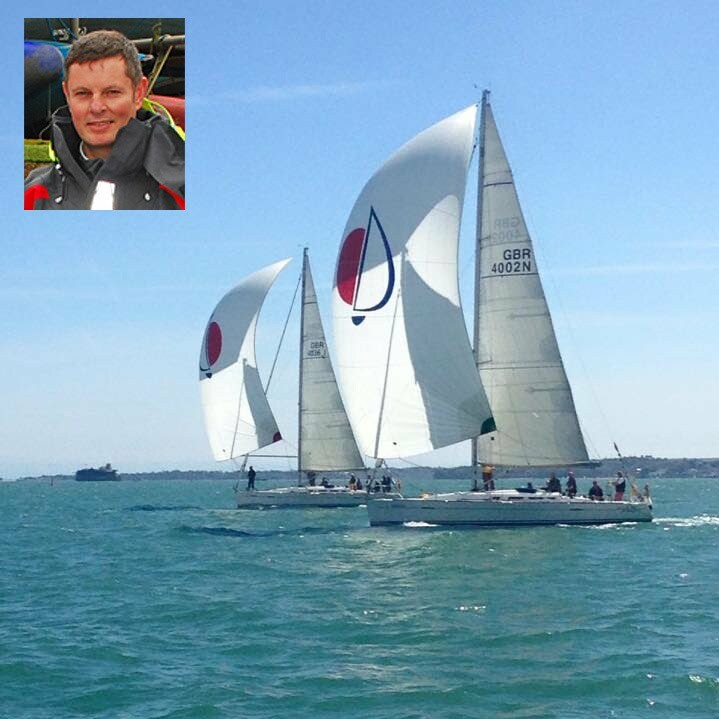 WGC Sailing Club member, Barry Leake* (pictured), is celebrating his team’s victory for the second year running, in the UK Firefighters Sailing Challenge which took place on the Solent at the end of April. He was Navigator and Tactician on board ‘4010 ’, one of 26 Sunsail F40 yachts competing in this national sailing championship. They won the event overall with a 1st, 1st, 1st, 1st, 2nd and a 3rd placing. In the 2014 championship, 21 yachts competed and Barry’s team won the trophy with a 2nd, 6th, 1st, 1st, 1st, 1st. It is held annually with entries from the fire, police and ambulance services, and raises money to help many charities. 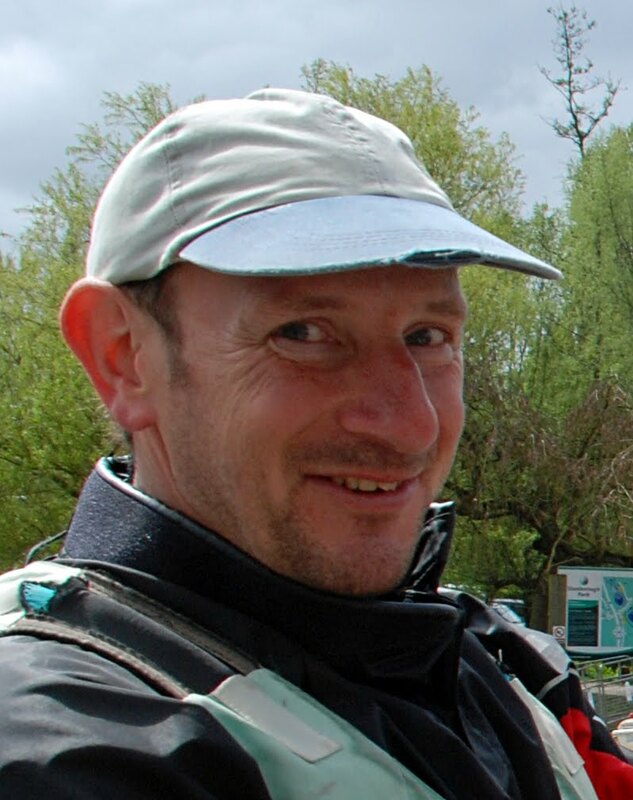 * Barry is also a former Dinghy Instructor at Stanborough Lake, and a qualified RYA Yachtmaster. 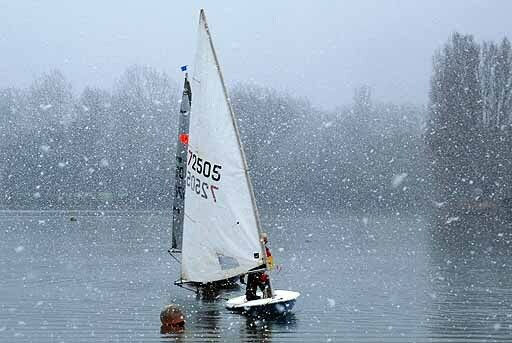 Alan Campbell wins Easter Regatta in challenging conditions. The full report, the photographs and all the winners can be found here. Your new Committee can be found on the contacts page. The full report on the business side of the AGM will be published with the Minutes in due course. The full report of Prize Winners from the various race series and other awards plus all the photgraphs can be found here. Don’t Panic Mr Mainwaring, it’s the Welly Challenge! “Dad’s Army” was the fun theme of this year’s Welly Challenge, the club’s annual fundraiser for charity; £257.45 this year for Help the Heroes! 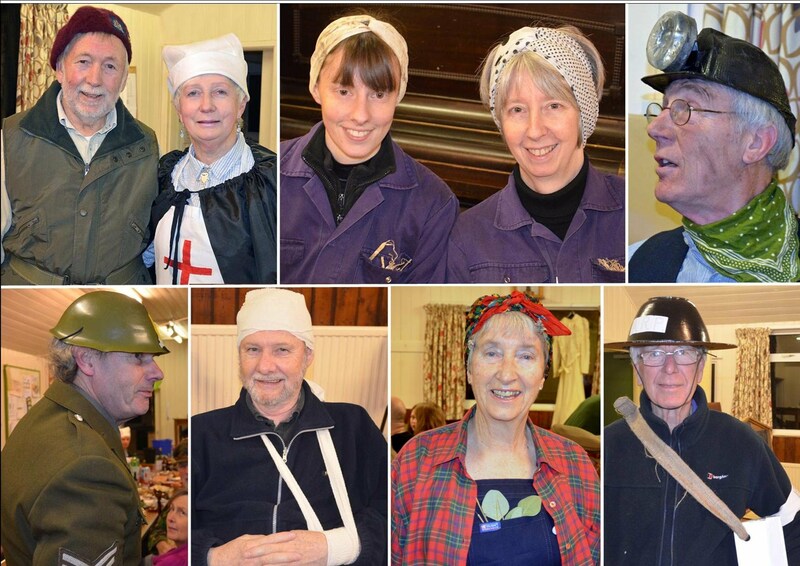 The characters who arrived at Mead Hall in Wheathampstead, included a grimy Bevin Boy, Captain Mainwaring himself, a Red Cross Nurse, and more....Read all about it and see the pics here. At the AGCM Tony was elected President of the International Flying Dutchman Class Organisation. He has promised do a brief report on the FD Worlds in Sydney in the near future. 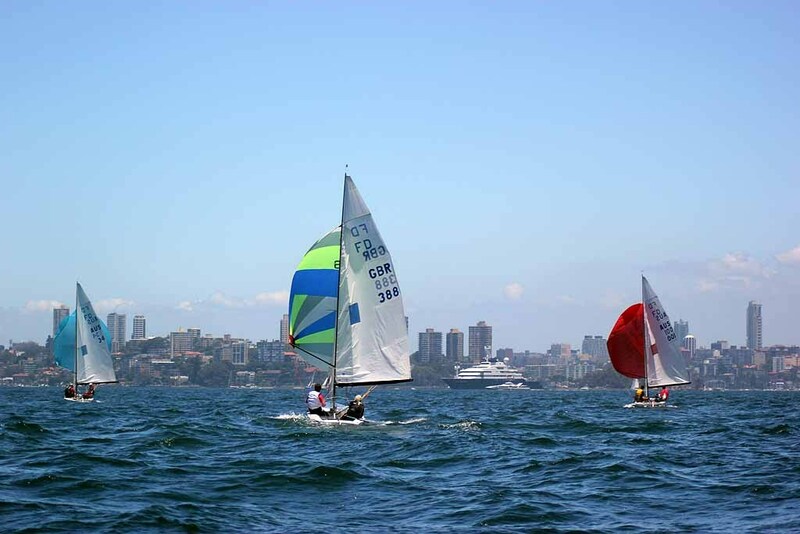 Meanwhile, here is a shot of Tony and his crew heading downwind with the spinnaker against the Sydney Harbour skyline. 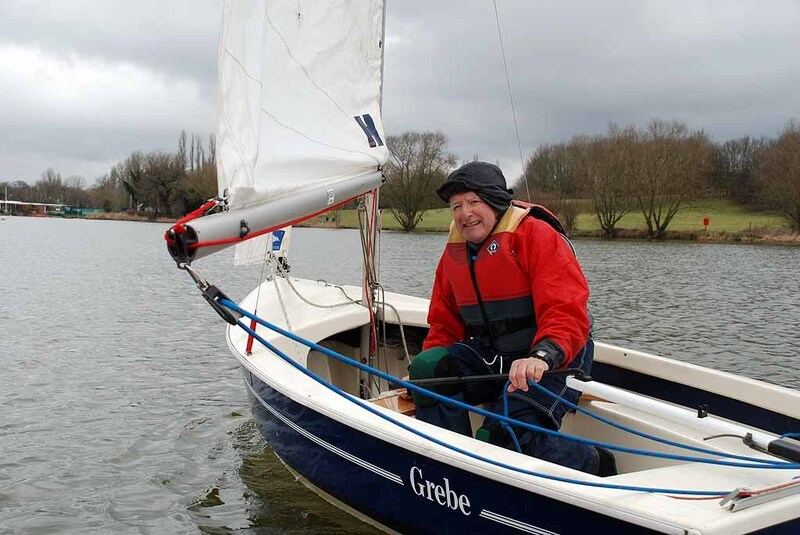 It was the first Anniversary of Stan's passing on February 14th and it felt like a lovely tribute to his memory to see Mike sailing his Gull on Stanborough Lake. Stan would have loved that, especially as Mike and Stan were such great pals and often used to compete in the slow fleet. On 7th February, the second race was all going so well (first pic) ..... until the sky suddenly darkened and the fleet was hit by a bitterly cold blast of driving sleet (second pic). 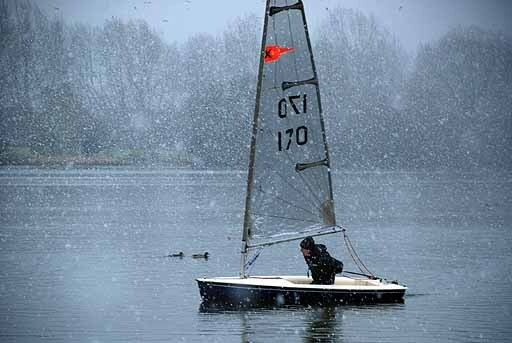 As always, our hardy sailors didn't flinch - well only a little bit...... Can Spring be far behind? First time out after Christmas, on the 3rd January, it was bitterly cold, grey, and thoroughly miserable at Stanborough. The usual intrepid Wellys ventured out but there was not a lot of New Year joy. 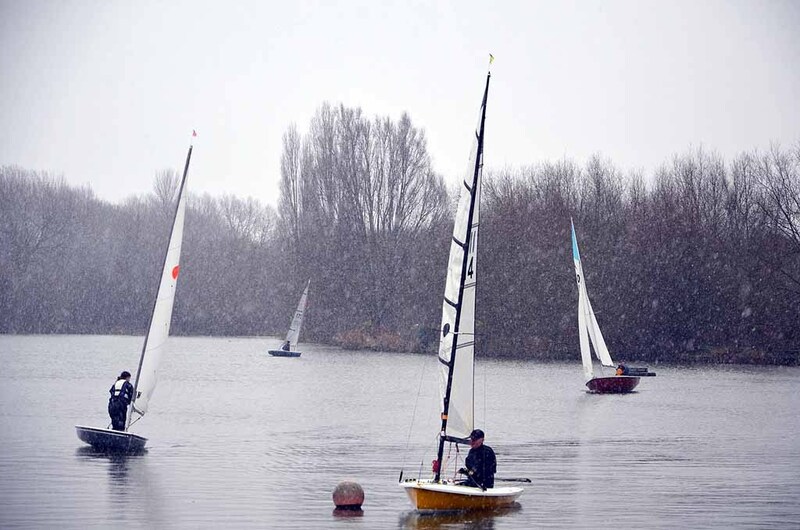 On the 10th January, sailing had to be cancelled because of extreme gale force winds. Today, 17th January, there was a snow storm just as the first race was finishing! Fortunately, the weather front passed over and 10 sailors enjoyed bright sunshine and blue skies in the second race. Val. 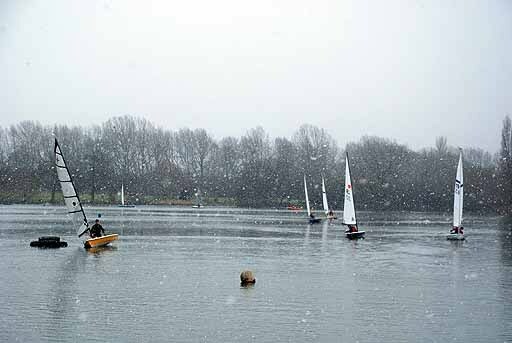 Peter Thornley writes: The last sailing act of 2014 was the Christmas Pudding Regatta on 20th December, consisting of 2 handicap races, each consisting of a fast and a slow fleet. Thirteen sailors braved the forecast of 16 mph winds, with stronger gusts, on a bright, cold and sunny day. The first race conditions were not quite so strong as forecast, and we only saw 2 or 3 capsizes, although a couple of the fleet got a bit too close to the lee shore and got stuck in trees. The ones who got it right were Annette Walter (comet), Richard Bull (streaker) and Sheila Stowe (comet) in that order in the slow fleet, and in the fast fleet Dave Lambert led Patrick Rohart and Dave Campbell, all in supernovas (or should that be supenovae?). The second race saw stronger winds with lively gusts towards the end, several unplanned swims and visits to the lee shore, and a change of fortunes for most except Annette Walter, who went on to her second win, followed this time by Nigel Davis (comet Xtra) and Richard Bull. Sheila opted to crew for Roger Morse in his leader, and is obviously an ace crew, as they went on to win the fast fleet race quite easily, followed by Patrick and Dave Campbell. Dave Lambert, after some unscheduled deviations into the trees, managed to scrape back into fourth. Roger's 7th in the first race, sailing alone, meant he did not get onto the podium. Well done to Annette and Patrick who got the large Xmas Puds, and Richard and Dave L who got the small puds. Following the racing, we all enjoyed hot mulled wine and hot mince pies provided as usual by Marjorie Adams. 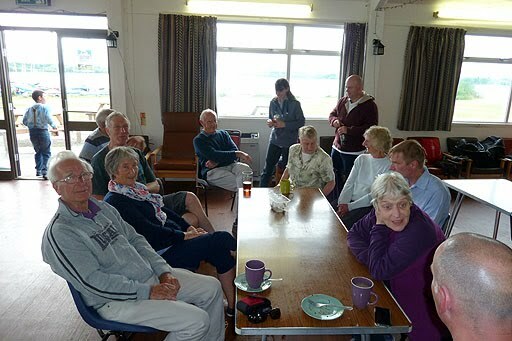 It was a sociable end to the morning, with as many non sailors as sailors coming for the wine, pies and chat. Many thanks to Marjorie, and to Ian Stringer, Val Newton and Phil Walter who had a busy time on duty. Val took a zillion photos in between aiding several wet sailors. 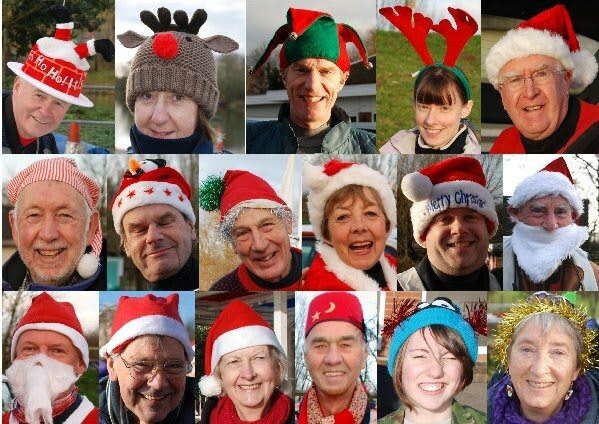 For a Christmas Pud pictures slide-show visit our Photo Gallery page here. 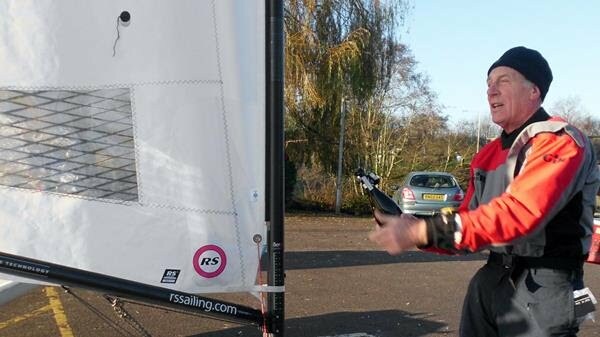 Val Newton writes: There was great excitement on Saturday December 13th, when Charles Adams, opened a bottle of champagne to mark the launch of his brand new RS Aero single-hander 'Sacre Bleu Trois'. Tot-sized glasses of bubbly were distributed around waiting Wellys, and many admiring comments were made about the streamlined newcomer to Stanborough. It is supposed to be faster than the Supernova according to Charles, but 'Sacre Bleu Trois' was taking it easy on her first outing and came last in both the pursuit races. Charles commented afterwards: "The pic of me in the boat [taken over the stern - Ed] was taken at the beginning of the second race and shows the sail a bit better shaped than in race one. 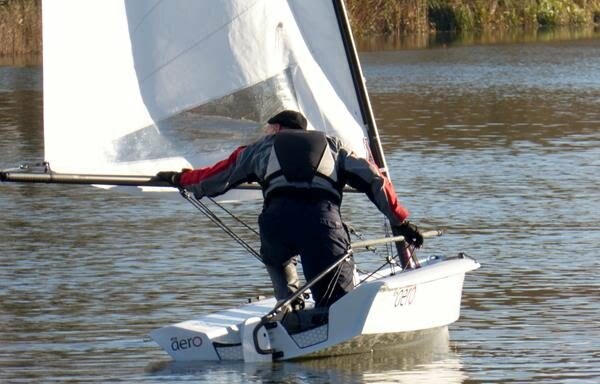 I have a steep learning curve ahead as it is meant to be more like a windsurfing set up - I need to study the set-up on un-stayed uni rigs of single-handed catamarans I'm told!" . Tony has sent us the following YouTube links as examples of life in the Flying Dutchman fast lane! Well it was blowing at least 3mph (in the gusts) and I remember that Phil Walter and Nigel Davis had led for most of the race in the comet and that Dave Campbell and Richard Bull were matching Peter and and I for the first 2hrs at least in the Supernova until Dave got headed and started drifting backwards whilst Peter made serious headway on Dave. It was a tight finish and we caught Phil with only a few minutes to go. All very close. So the result was...First, Dave Lambert and Peter Edel; Second, Phil Walter and Nigel Davis; and Third Dave Campbell and Richard Bull. 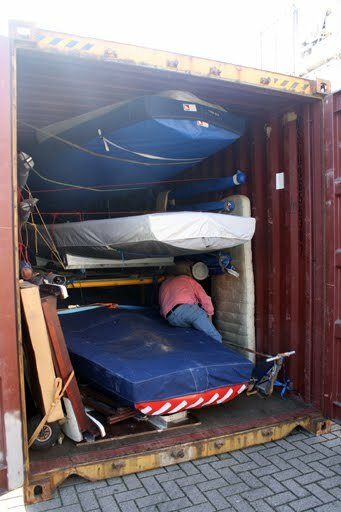 Whilst many of you were enjoying the spring-like conditions down at Stanborough on Saturday morning, 1st November, I was doing a 24 hour round trip to Holland and back to load my FD in the Class container ready for shipping to Australia for the 2015 Flying Dutchman World Championships in Sydney at the beginning of January. 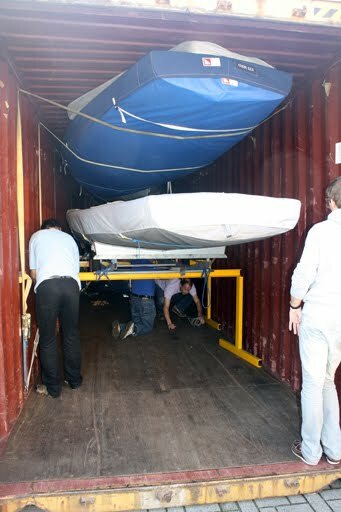 With careful planning and packing we can get 6 boats in each container plus all our gear spares, bikes etc. Two containers were loaded earlier in the week, one in Berlin the another in Hungary and are currently being transported by road to Holland,. That just left the other 2 containers for us to load. So we had agreed that we would all meet at 09:00 on the Saturday morning in the container yard at Oss. Some of us had slightly longer drive than others!!! The only advantage of driving overnight was the roads were clear, so it took just 3 hours from Calais so we had enough time to grab a couple of hours kip and a bit of breakfast. 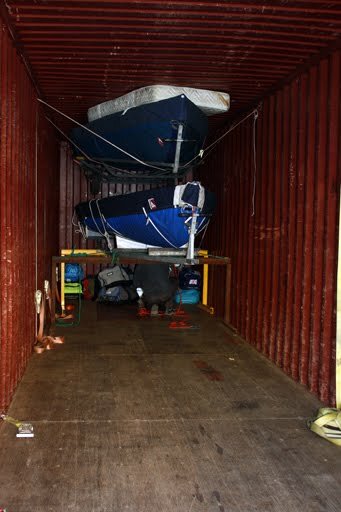 Apart from the GBR team from Southport (who were nearly 2 hours late) everybody arrived on time & so we ‘cracked’ on without delay and with the help of some addition volunteers we had packed both containers within 3 hours. A few quick good-byes and we were back on the road to Calais. The Annual Dinner following Commodore’s Cup in the morning, mysteriously morphed into ‘The Roger Morse Show’ when he took to the floor to propose the toast to the club. Roger had everyone in stitches as he totted up how many movements Dave Campbell’s legs and arms had made whilst sailing at Stanborough. After getting the diners to simulate all the actions of pulling sheets and moving about the boat, he concluded it must be many millions and gave Dave a can of WD40 to oil his joints. This caused much hilarity and fortunately Dave took it all in good humour. Speaking ostensibly from ‘Val’s Notes’ which were propped up in front of him, Roger rambled on, raising lots of laughs along the way. He presented a surprise bouquet to Thelma Cardinal to mark hers and Brian’s 39th anniversary; read out a touching message to members from Sammi-Leigh and spoke of the sad loss this year of her grandfather Stan Grace; and of the loss of former member Surakhsha Patel. He also thanked and praised the club for raising almost £3,000 for charity through Welly Challenge evenings over the years. His performance was memorable to say the least, and it set the seal on a very enjoyable evening which was attended by most of the club. Grateful thanks to our hard-working Commodore, Peter Thornley, for doing the lion’s share of organising the event which took place at WGC Golf Club. Thanks also to Tony Hale, Sheila Stowe and Val Newton for their quizzes, table decorations and slideshow. The raffle was a great success and raised £122. Louise Hunt, Graham’s daughter deserves a special mention for her unbounded enthusiasm selling tickets. 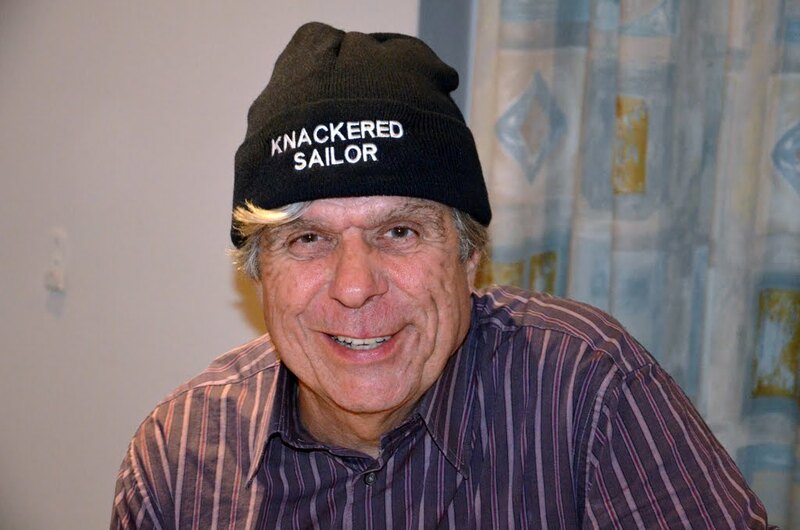 Possibly the most delighted raffle winner was Tony Stowe, who chose a woolly knitted hat embroidered with the words ‘Knackered Sailor’! At the end of the night, Race Officer, Phil Walters, announced the trophy and prizewinners for the Spring-Summer Handicap and Spring-Summer Pursuit Series. Commodore Pete turned out to be the star, winning Slow Fleet in the S/S Hcp and first place in the S/S Pursuit. He beat Sheila Stowe into second place in both cases. The fast fleet cup in the S/S Handicap went to Julian Gunnell but he was not there to receive it. The full 2013/2014 Results can be seen below. The half-year race results for the 2014-2015 Spring Summer Handicap Series and the Spring Summer Pursuit Series announced at the Annual Dinner were as follows. Two individuals tied for first place on points count. Decided on number of highest positions. Peter Thornley writes: The wind forecast for the morning was 14mph southerly veering to south west during the morning. Arriving at the lake at about 9.00, there was plenty of wind and the direction and strength about right. The forecast rain didn't happen. Tim Hogan and Tony Lyall in the safety boat laid the buoys to give maximum beats diagonally across the lake, but as usual, Stanborough lake had winds all over the place and beats seemed to crop up on most legs. We had fewer sailors than last year, and the first 3 from last years race could not sail for various reasons, giving an opportunity to others. Fifteen sailors turned up, but Sheila and Val opted to crew for Roger and Tony in the Leaders. Val and Tony obviously had a great time as shown in the photo below. Who said racing sailing boats was a serious affair? The first race was hard work, and had several of the less fancied helms up front for a couple of laps. Eventually Alan Campbell (supernova) fought his way through the pack to win, followed by David Lambert (supernova) and Nigel Davis(Comet). The second race seemed generally lighter winds, but with some brisker spells. Alan got off to a good start and lead the way throughout, but was closely followed all the way by Richard Bull in his streaker. Richard stayed ahead of several faster boats until quite close to the end, and eventually won. Alan was second, and David Lambert third. After adding the 2 scores together, the final result was Alan came first with 3 points, David second with 5 points and Richard third with 8 points. Presentation of the trophy followed, and we all enjoyed hot punch made as usual by Marjorie Adams. Many thanks to all who braved the weather forecast to sail, and to Tony Lyall and Tim Hogan for manning the safety boat, and to the members who turned up to spectate, support and drink punch. ....while Pauline Shaw (AOD) is poised with pen to record the laps. Stewartby Away Day July 12th. 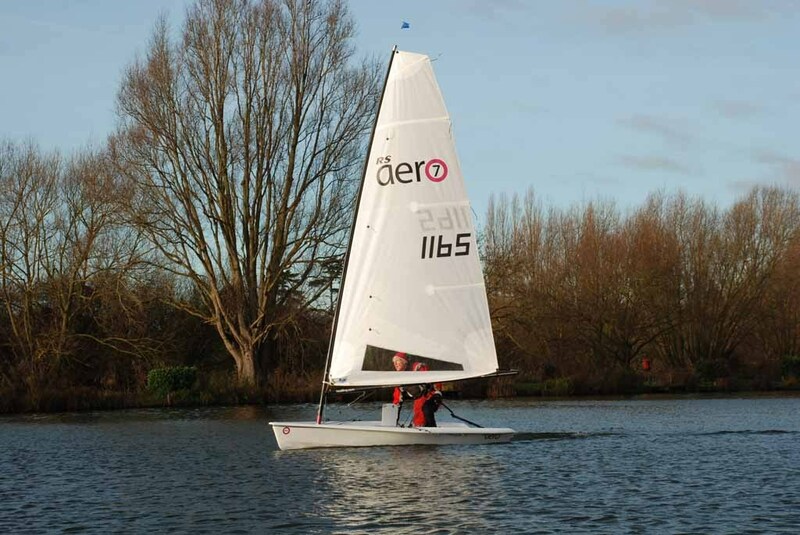 Peter Thornley writes: The main reason for having a Club Awayday is to try sailing on a large open water. If the weather is right you can get on a planing reach for 400 yards, and try different adjustments to tune up your beating, and different approaches to running. This all makes a very pleasing change from fluky old Stanborough. So what did we get last Saturday? We got Stanborough weather, and lots of it! Mostly quiet and very variable in direction and strength. (2 pictures on left below) was in the winning team, but I cannot remember who else. As usual, we were made very welcome by all the members and Committee at Stewartby, had an excellent lunch from their galley, and then 2 races in the afternoon for the inter-club trophy. Here I have to admit that I sabotaged our efforts by telling people that I thought the races started at 2.00. They started at 1.30! Needless to say, several of our sailors were somewhat late starting in the first race. We were on the ball in the second though, and did better, but not well enough to win the trophy. The first 5 from each team count, and we scored a very creditable 29 points to their 23, closer than last year. 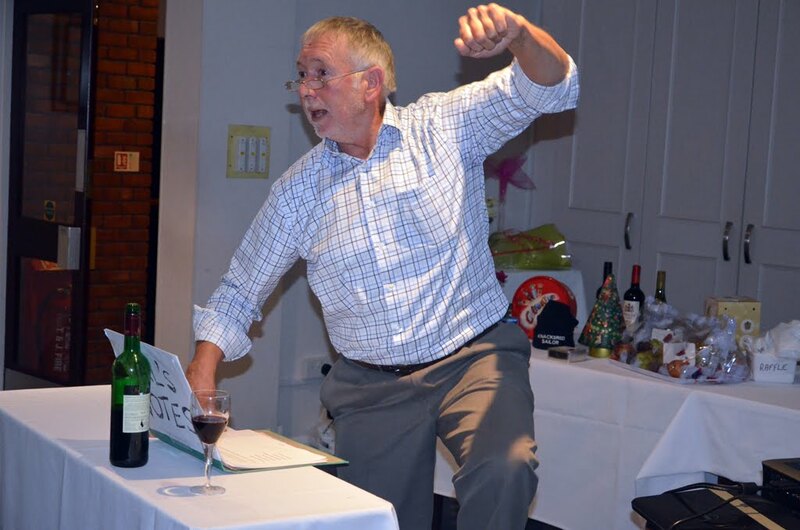 Our main man this year was Julian Gunnel who came third overall, winning a bottle of wine for his efforts, being beaten by another Phantom and a Buzz. Our other sailors were Charles Adams, Val Newton, Maureen Blunt, Phil Walter, Mike Caddy, and Peter Thornley. Brian Cardinal ventured out for the first time in 9 months, in a Stewartby Laser, but did not race. We had 4 or 5 supporters, who walked around the lake. The third picture shows Brian in a boat for the first time after his accident 9 months ago. The final picture shows Julian getting off to a flying start in race 2 of the inter-club competition, with me, Mike Caddy, and Phil Walter in the pack in the background. 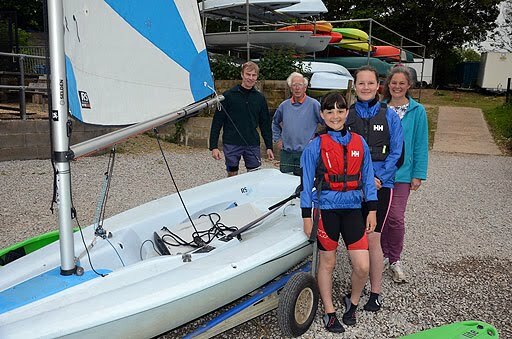 Again, many thanks to the Committee and members of Stewartby Water Sports Club Sailing Section, for inviting us, and for their hospitality on the day. I've booked us in for next year. To start with, we would like to thank everyone who came and supported us over the weekend and who donated money towards the charity, it was much appreciated by the whole team. Also a very very big thank you to Charles who took the boat to and from Paxton. There were only 7 teams this year, including ourselves in a RS Feva and 2 other Fevas from Grafham and a RS Vision junior side from little paxton. We are very pleased to say that our team finished 4th out of the 7 teams, beating the Paxton junior side and both Grafham teams, as a result we were the top Feva and also the top junior team at the event, meaning that we get back the Junior plate that we won 2 years ago. We won by a margin of 6 laps on handicap on the Fevas and by over 12 laps on the Vision. But nothing could be done by any team to stop the home team's Solo from winning the whole event. A final big thanks for all the support. You have done Welwyn Garden City SC proud, especially as you were rather 'out there' on your own this year. It must be nice to have that Junior Plate back after an absence of two years. Well done to you and everyone in your team. I look forward to hearing more details when I next see you. Hope a few Wellys managed to drive up for the day and support you. As for that wretched Solo, I think you'll have to start work on developing a radio-controlled torpedo for next year! 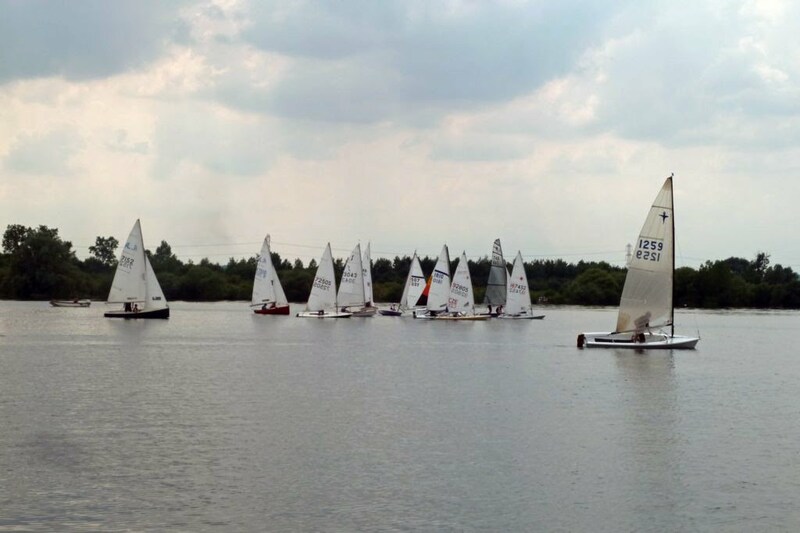 The Annual Summer Regatta was held on 14 June with an excellent turnout of 18 boats. The format is 2 slow and fast fleet handicaps in the morning, with a trophy for each fleet, and a normal pursuit race in the afternoon for a separate trophy. Wind conditions were generally northerly to north easterly, with the wind strength building as the day progressed up to the promised 9 mph or so. A surprise rain cloud cooled things down in the first race. 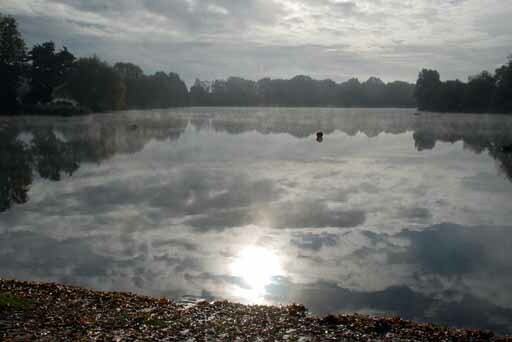 OOD Ray Wilson set a figure of 8 course to give the rare luxury of a beat for the full length of the lake, but there were as usual some fluky areas. Fortunes were mixed. Graham hunt won the first slow fleet race but retired in the second. Commodore Peter Thornley won the second slow fleet race after a very poor first, but Phil Walter was the overall winner. Alan Campbell won the fast fleet trophy.The afternoon pursuit saw a reduced fleet, and was won convincingly by Julian Gunnel who took the lead with a lap to spare. Many thanks to non-sailing members and friends Ray Wilson, Brian Cardinal, Tim Hogan and Peter Edel for performing the duties. The weather forecast for Saturday May 10th was extremely hostile - wind gusts of 20mph in the morning rising to 30mph later in the day. Commodore Pete Thornley cancelled the race coaching session planned for early afternoon, but it didn't stop six intrepid sailors venturing out in the morning. Dave Campbell and David Lambert (Supernovas), Mike Caddy (Laser), Tony Hale (Leader), and Phil Walter and Graham Hunt (Comets) managed the gusts relatively easily in the first race . . . then a torrential downpour arrived. By the start of the second race the wind had strengthened considerably, and one by one they all capsized multiple times (but only one within camera range (below)! The forecast had been about right! 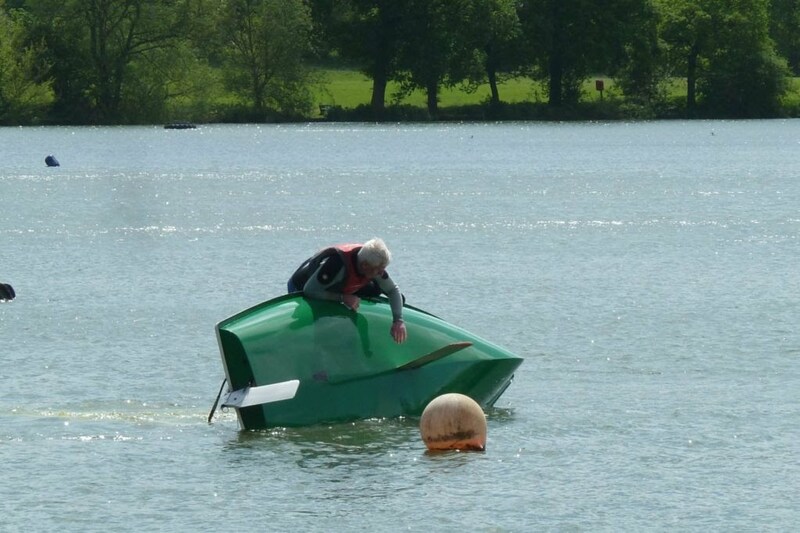 "A WAY TO DISCOURAGE CAPSIZING"
Streaker Alan wins the Easter Egg Cup! 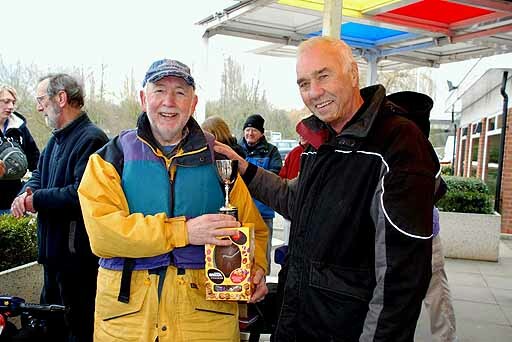 After a morning of brisk sailing, there was a sail off between Alan Campbell, first in the fast fleet, and Pete Thornley, first in the slow fleet, to decide this year's winner of the Easter Egg Cup. The pair swapped their Supernova and Streaker for the contest which made things interesting. When OOD Ray Wilson blew the hooter, Alan quickly got the Streaker over the start line and sailed away to the first mark. Frustratingly, poor Pete couldn't get the Supernova moving because he was stuck in a notorious Stanborough hole. Eventually he had a slight whiffle of wind, and managed to sheet in and take up the chase. The course was a simple triangle and Alan was the victor and won the Easter trophy. Tantalisingly, Pete had nearly caught him by the end ... one more lap and who knows? 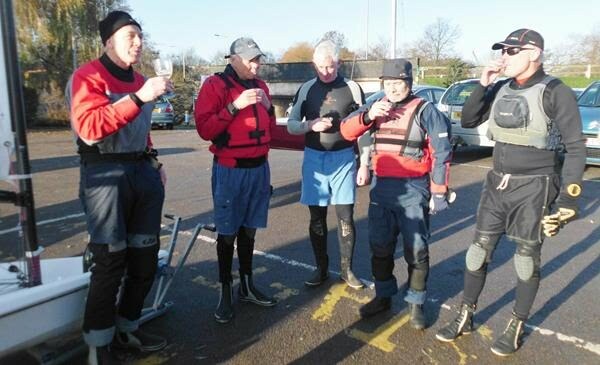 Afterwards, Welly sailors and Mouse Club members enjoyed a Cadbury's Creme Egg. 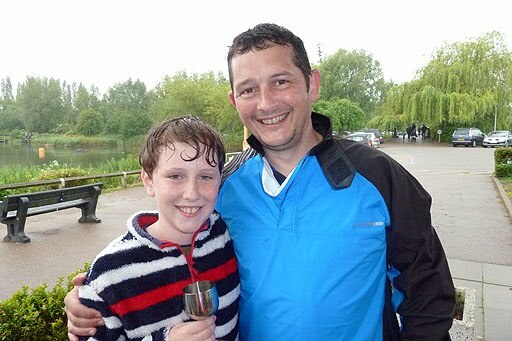 LAKE GROWS AND WELLY CHALLENGE RAISES £250 FOR CHARITY! A real celebratory Commodore's Cup race in the morning with our Anniversary Dinner and Prize Giving in the evening....Read all about it. SATURDAY MORNING 15th MARCH AND ANOTHER BREEZY SATURDAY! Some great pics from Tony Lyall on another breezy Saturday .....a prize for anyone recognising the sailor using the personal tea-bagging technique! Answers on a postcard, please. FEBRUARY 8th 2014 - A DAY TO REMEMBER! LAKE GROWS AND "WELLY CHALLENGE"! Yes! The Lake was too big to sail on, yet the Slow Fleet had a great victory! 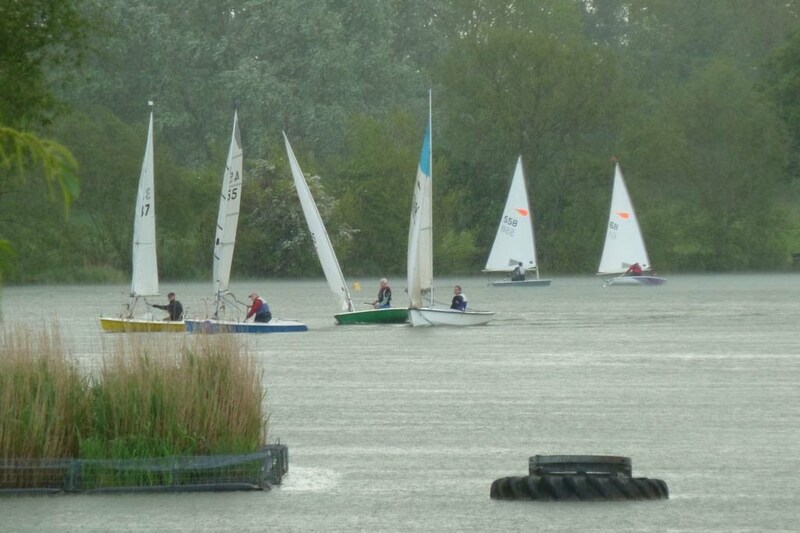 Stanborough Lake - too large for sailing! Would you believe it?!!! Finesse declared the Lake too large after recent prolonged rainfall in the area. The river level overflowed into the lake and water levels rose well above all the walk ways, the angling stations and some of the pathway between river and lake. There was no launching area in the lagoon with the water well up the ramp to the boat storage area. Finesse considered the conditions were unsafe for boat launching and that boats could get damaged by striking underwater obstacles like fishing stations. The photographs shown here were taken after the water had fallen 8 inches or more (about 20 cm for our younger members!) from its peak - note the debris on the ramp to the storage park. There was a great turnout for this year's Welly Challenge held at the Mead Hall, Wheathampstead on February 8th. 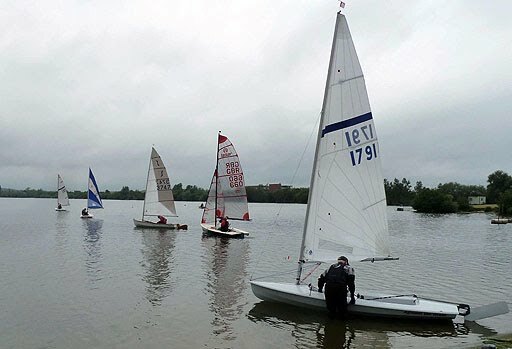 Sailing had been cancelled by Finesse earlier in the day because of flooding at Stanborough Lake, and sailors were eager for some competition. For the competitions, Roger split the group into two teams; The Slow Team and The Fast Team, The Slow Fleet team got off to a good start and never looked back, racing to a resounding victory in spite of a mid-evening rally by the Fast Fleet. 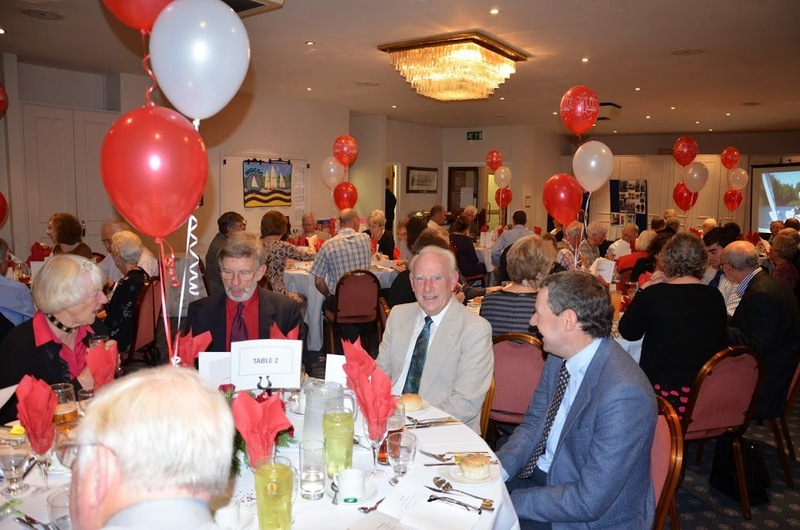 The theme of the evening was the club's 40th Anniversary and everyone had been invited to wear something red. Host Roger Morse, went round the room highlighting the various items of clothing which ranged from socks to complete outfits, as worn by the Hales. The evening's entertainment included brain teaser quizzes and a fun challenge from Carol Brown, who invited participants to hold a pencil with both hands and change its position in a certain way without removing either hand. A line-up of around 12 sailors struggled to solve the seemingly simple task but it was youth team captain, Matt Cory, who finally cracked it. Roger and Peter presented the "Rudderless Competition" (a sort of "Pointless" exercise with Peter taking on the role of Richard!). 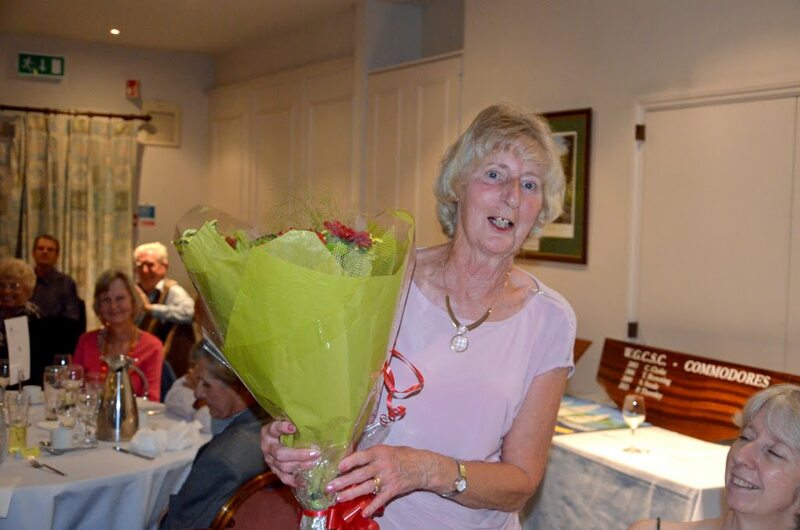 The evening raffle raised a total of £250 which will be donated towards Leukaemia Research. As the 2013 season draws to an end so possibly is Colin’s tenure at the front end of the ‘ship’. his current circumstances mean he is unsure if he can make the commitment any longer and so I find myself on a mission to find a new crew for next year. My plans include doing regattas in Germany, Holland, Spain & Italy in the build up to the 2014 World Championships at Largs in July & then just 6 months later off to Sydney for the 2015 World Championships. 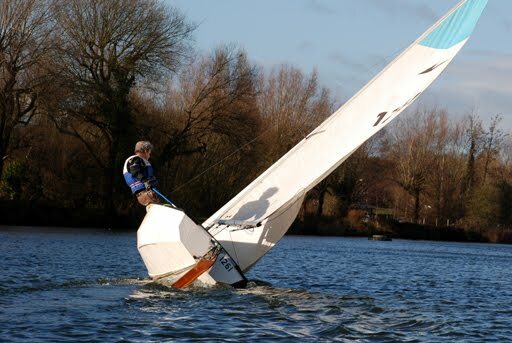 I’m looking for someone who has ‘bags’ of experience crewing a high performance trapeze dinghy preferably with a symmetrical spinnaker. Ideally they should be 180 – 195 cm tall and weigh something in the range 85 to 100kg. If you know of anyone who may be interested I would be grateful if you could get in touch via info@wgcsc.org.uk . It was great to see so many Wellys, past and present, turn up for the end of year event, including the Forsdikes in force (John & Janet, Ian + children Ella and Owen), Idris Wurie (now 6ft. 3in. tall! ), Meryl & David after their traumatic year of illness, and Brian Cardinal, now walking after his dramatic knee injury at the lake. 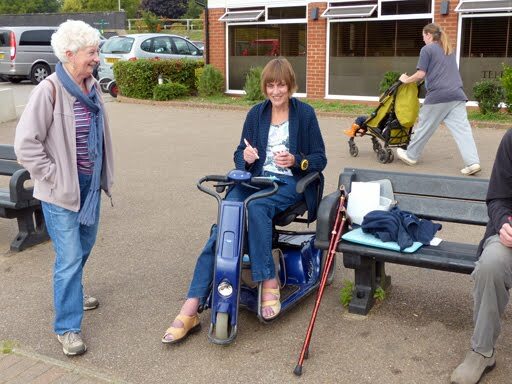 To everyone's amazement, Cheryl Luxford also put in an appearance, having been discharged from hospital on Thursday. She was very tired but delighted to be there. 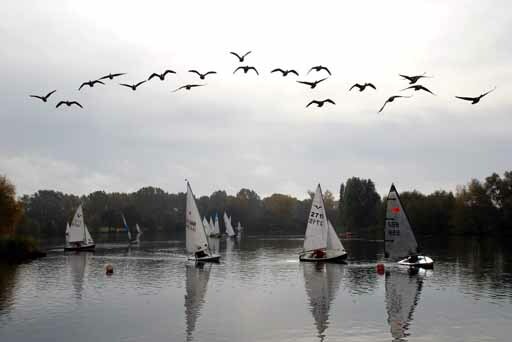 The sailing took place in rainy, miserable conditions and there were a number of capsizes. Neither race was fully completed but, in the end, the fast fleet winner was Peter Edel, with Julian Gunnell 2nd, and the slow fleet winner was Phil Walter, with Graham Hunt 2nd. Tony Hale got a special mention for managing to continue sailing with a boat full of water! After the sailing, there was mulled wine and mince pies, and everyone was given a miniature Christmas pud knitted by Marjorie Adams(see pic). She made 40 in all to mark the 40th anniversary. Thanks Marjorie, they're delightful and made the occasion extra special. (For those lucky enough to have one, you can turn them into a Christmas tree decoration after eating the chocolate by just popping cotton wool inside and attaching a thread). Thanks to OOD Tim Hogan and his assistant Ian Stringer, and Rescue Driver Tony Lyall and his assistant David Brown. Peter Thornley writes: Saturday 21 September arrived with no wind, and matters hardly improved for the racing. This situation seems to occur frequently, with 2 races being cancelled in recent years. Perhaps it's to do with the Equinox, and we need to make a sacrifice to the Wind God. The Punchbowl trophy race is a long team pursuit race, where normally 2 crews swap over every one or two laps. There were 5 teams. Father and Offspring teams - the Campbells and the Walters; the Ancient Mariners Cardinal and Thornley, the Morse and Bull Team (who had so much to talk about that they both stayed in the boat all the time! ), and a 3 man team of Lambert, Edel and Higgins. OOD Ray Wilson set a simple course from the beach to mark 5, then a beat to 6, and return to the beach every lap to change over. As usual, the Walters set off quickly and for over an hour looked untouchable, staying a half lap ahead of everyone else. Then the Supernova of the Lambert team slowly reeled them in and passed them, and in the end were comfortable and worthy winners. The Walters came second, and the Ancient Mariners third. Daniel Higgins, sailing a Supernova for the very first time, was the star of the show, being probably the fastest of his team. Many thanks to Ray Wilson, Ian Stringer, Tim Hogan and Peter Davies for being on duty, and also many thanks to Marjorie Adams for the hot punch, and Charles Adams for taking lots of photos (which we will see in due course). Pete. Pauline Shaw, our intrepid Sailability Welly, has brought back a Silver Cup from the Challenger National Championships at Rutland. 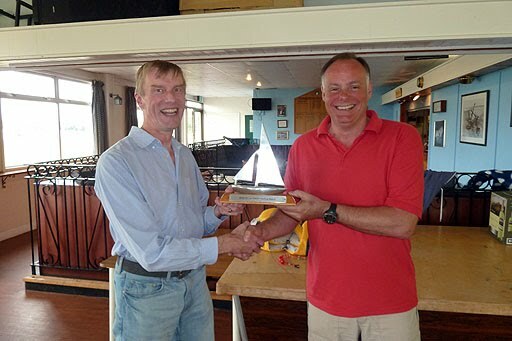 After sailing eight tough races back-to-back over the weekend of 20/22 September, she came 2nd in the Silver Fleet and was presented with her trophy by Andrew Hunter, Chairman of Rutland Sailability. 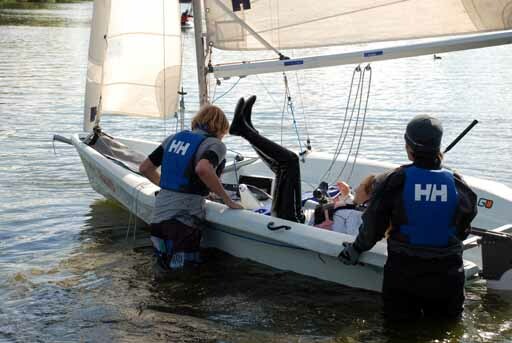 Pauline, who has MS, competed against 22 other disabled sailors, some from as far afield as Hungary and Scotland. Her best placing was in the seventh race where she came in 6th. Conditions for the whole event were just about perfect, ending on a high note on the Sunday with wall-to-wall blue skies and sunshine, with a good breeze to keep things interesting. Afterward, Pauline said she was very pleased, because her success meant she “was back” and fully recovered after breaking her hip the Christmas before last. Alastair Luxford: Kestrel National Champion! 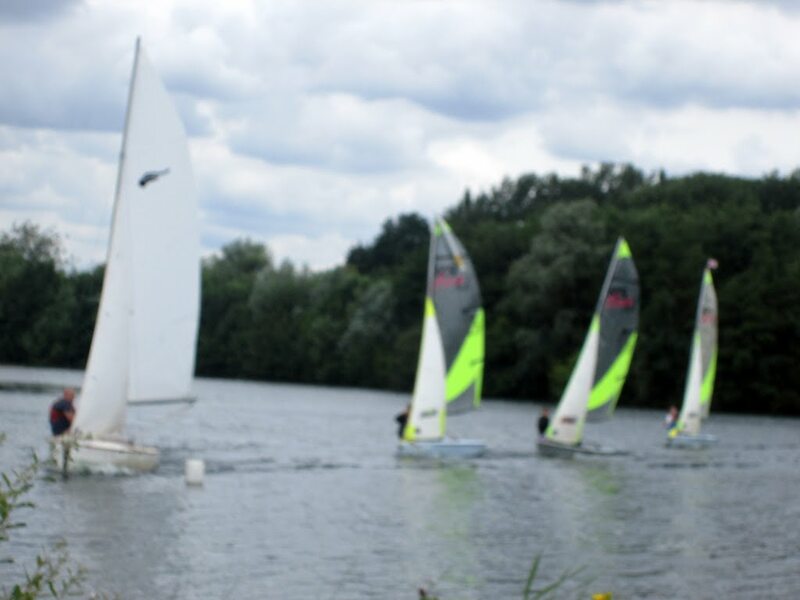 Alastair, and his helm Liam Pike, sailed to victory at the Kestrel National Championships at Stone Sailing Club on 28th July. They competed in Granny Apple, the boat previously owned and campaigned by WGCSC's Mike Smith. Alastair had previously crewed for Mike from the age of 14 until he went off to University, and the pair had competed in Kestrel Nationals from 1981 to 2009. In appreciation of this, Alastair's first act after becoming National Champion 2013 was to have a plaque made for his mentor which read: "Thanks for helping me get my own wings. Sorry we couldn't do it together". Mike and his wife Sylvia (see pic) were very touched. 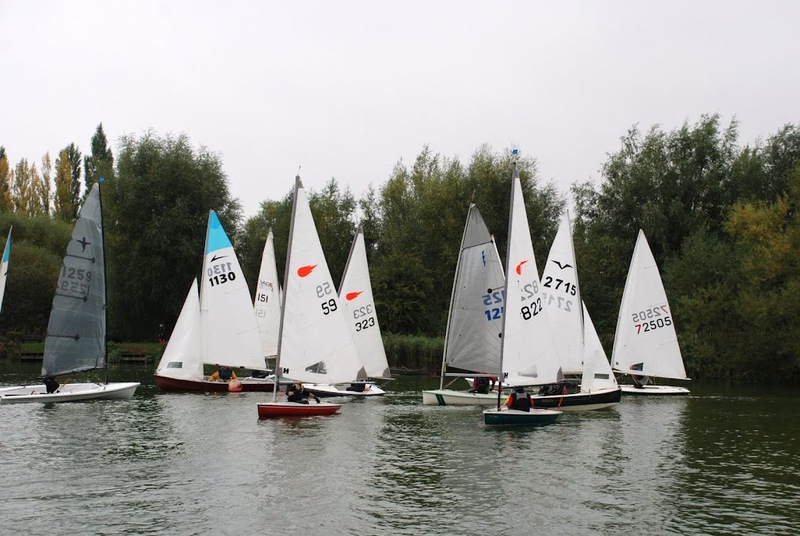 The August Bank Holiday Weekend has become synonymous with a camping weekend at Barton Turf Adventure Centre run by Simon and Sheila Fishwick to enjoy the sailing and other activities in the area, It also coincides with the Norfolk Punt Club Regatta when a broad spectrum of sailing craft participate in the open race meeting run over the 3 days. This year 10 club members went along - Roger and Sybil, Stan and Evelyn Grace with granddaughter Sam. Richard, Mary and Dan Higgins, Tim Hogan and David Brown. Everyone was kept well supplied with energy from Sheila's full English breakfasts, buffet lunches and dinners of roast pork on the Saturday and a barbeque organised by Simon on the Sunday. Apart from rain overnight on the Friday night and a damp and misty start to Saturday, the weather was excellent with a force 2 or 3 breeze most of the weekend with no serious gusts. The sailing was excellent and together with the sight of the large sailing cruisers with their gaff rigs sailing majestically around the broads made for a memorable experience.There was also opportunity to take out some of the Adventure Centre's boats - Toppers, Lasers, Wayfarers, power boats, canoes and others. Sam spent some hours in a Topper. Stan and David took out a Wayfarer on Sunday morning. Stan had brought his 3-person canoe fitted with an electric outboard motor (Cheating? What?) and he took David and Tim on an 8 mile return journey along some of the dykes which feed Barton Broad. Above: The Higgins family arrive in their classic VW Caravelle 4X4 with Dan's Laser in tow; Sam departs the moorings for a tow down the dyke to the broad; one of the large cruisers at speed. An excellent weekend with something for everyone to enjoy! 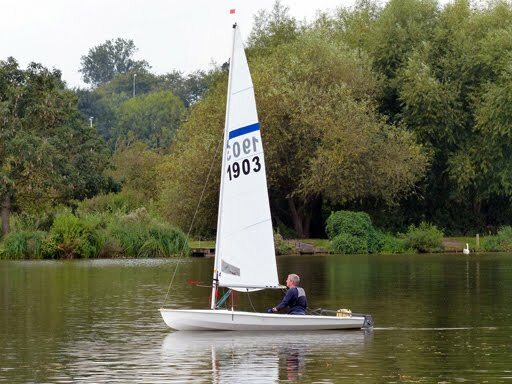 Peter Thornley writes: On 27 July the club was invited to sail at Stewartby for what is now a traditional inter-club event, with free sailing on the large Stewartby lake. Perhaps because this year it was in July, instead of September as previous years, and following on so soon after the 24 hour race at Paxton Lakes, the attendance was a bit down on previous years. There were 10 sailors from Welwyn, and 3 supporters. In total there were 22 boats, so quite a busy start line. Shaun, Julian, Annette, Phil, and Richard all took their own boats, and Peter (me! ), Charles, and Sheila all borrowed boats from Stewartby. Val and Maureen crewed for Sheila in a Bahia and Charles struggled with a Feva. Both boats were new experiences for the helms. Peter (me!) sailed an old Laser. The conditions were sunny and for the first race very fitful and light winds. The second race was much better, with a decent force 2 for most of the time. The course was a simple triangle. The first race started on a very light run, and the second race started with a late shift to a strong port bias. In both races, those who got the start right benefited strongly. Annette was our star turn getting a first and third to end up second overall. Shaun must be a strong candidate for the 'flash in the pan' trophy, getting second in the second race, beating Annette possibly for the first time ever! He was 6th overall. 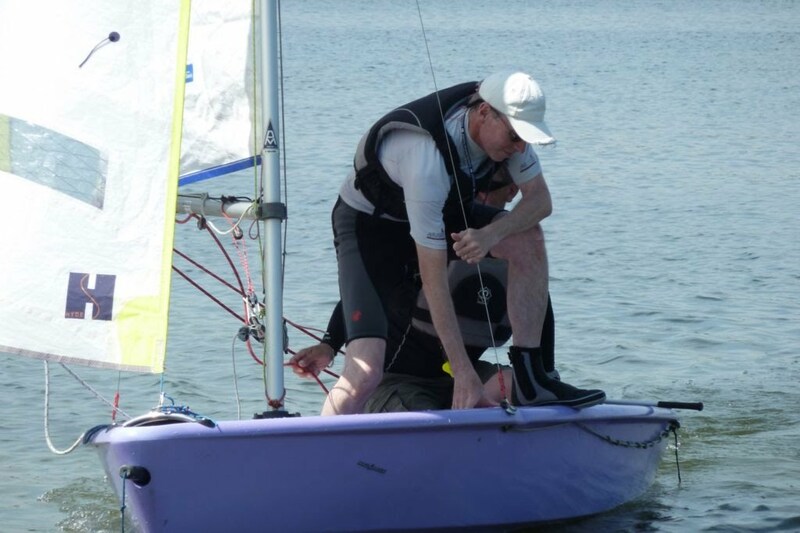 Peter got 2 very good starts to get 2 fifth places, and 5th overall, (and was first normal laser). Julian was the next WGC helm in tenth place. So once again Stewartby beat WGC, by 23 points to 34, counting the first 5 places. Many thanks to Stewartby Sailing Section for their warm hospitality, and generous loan of 3 boats, and thank you to all who went from WGCSC. Conditions were hot and sunny, with light and fitful winds: in fact so light the race was stopped overnight as every one ground to a halt. Lots of weed added to the problems. There were 7 teams in total, 4 senior and 3 junior teams. We entered a Youth team and a Supernova team, captained by Matt Cory and David Lambert respectively. Our Teams performed very well, both coming second in their class. 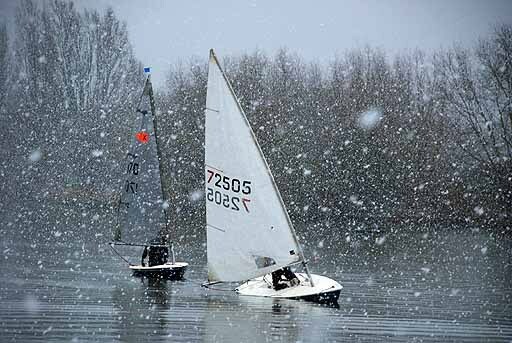 Despite the conditions being much more suited to the very experienced British Moth team from Hunts Sailing club, our Supernova team, captained by Dave Lambert, put on a good performance being only 1 lap behind the Moth on corrected time to finish second. The team (left to right) consisted of Patrick Rohart, Dave Lambert, Pete Edel, Chris Clarke and Dave Campbell. Matt Cory worked hard to pull together our Youth Team and it did very well despite having the handicap of sailing an RS Feva, not known for its light weather performance. “We arrived at Paxton with a relatively inexperienced but never the less determined and excited team hoping to reclaim our title as Junior Winners. The team consisted of Jim Cory, Abigail Hall, Sammi Lewis, Natalie Andrew, Caitlin Andrew, Phill Clarke, Milly McAlister, Samuel McAlister, Nash Gabbey and myself. “In the first couple of hours, we struggled to get around the weed as everyone at one or another point got stuck. But after a couple of hours, we got the hang of it and overtook the Cambridgeshire scouts in the Laser Pico and started to make ground on the RS Vision from Paxton. The wind only deteriorated however, and the race was postponed from 7:30 until 7:00 leaving us a very hard task of regaining our 5 laps on the Vision. Well done to both teams, and a big thank you to all the supporters who helped with the duties. and Chris Clarke looks for some wind or is he on his knees seeking divine intervention??!! Annabel and Bryony have achieved a very creditable 12th out of 27 entrants in the Girls 420 Championships. A fuller report will appear in due course. What fun! Thanks to Charles and Marjorie for organising our 40th Anniversary Welly Canal Cruise on "The Pride of the Lee" through the Lee Valley Park on Wednesday 21st August. There were 19 on board but unfortunately, Richard and Mary Higgins didn't make it to the boat by departure time and we had to leave without them. Our sedate trip took us through a couple of locks, and we were able to enjoy the local wildlife including ducks, coots, rowers and garden gnomes. The undoubted highlight was our fish and chip supper which was delivered direct to the boat and served at long tables either side of the cabin. The boat was festooned with 40th Anniversary red balloons and many sailors wore red in honour of the occasion. A good time was had by all. Just a reminder that you need to set up the buoys around the lake on Saturday mornings. This means you need to arrive in time to allow for this extra activity! Yes, it was breezy, but veered between being totally manic and nothing at all. The hot spots were marks 5 & 6 as usual. The start of the first race was nerve-racking ... Patrick even put on a crash helmet, obviously expecting trouble. Everyone went out with great trepidation, then crazily, they all got bunched up at mark 4 (the first one of the course) because it was in the lee of the trees. Basically they came to a full stop. When they came ashore at coffee time everyone seemed shattered and they were glad of their sugar fix from the cakes. The second race was easier and the sun came out. The afternoon pursuit (reduced to 10 boats) was going OK up to the point a tropical downpour started. They all set off in the lively conditions, everyone hoping to win but it was Julian who won the Fast Fleet Trophy. The Fast Handicap Summer Regatta Trophy had been missing for four years but thankfully it reappeared for the club's 40th Anniversary event. It was presented to a delighted Julian (centre), but Charles (left) who won it in 2011, and Peter (right) who won it in 2012 couldn't resist holding the handles for the photo because they'd only ever received a handshake from the Commodore in lieu! 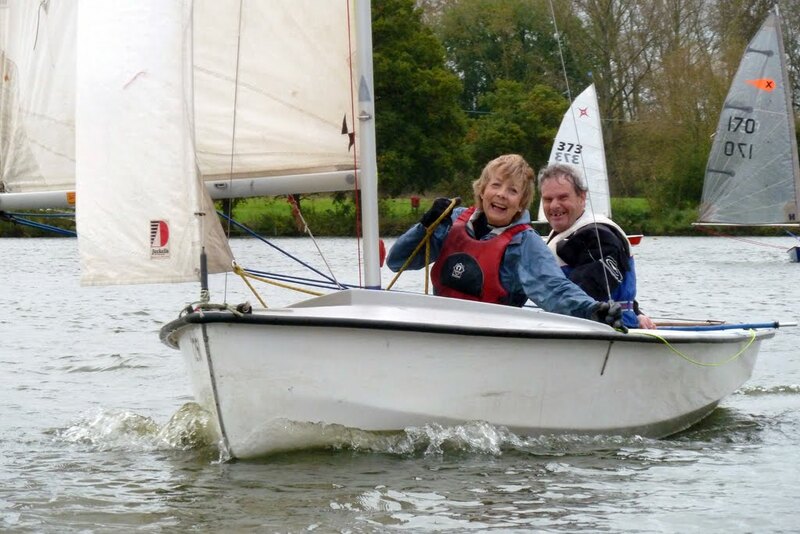 Meanwhile, Annette (in action above) won the Slow Fleet Summer Regatta Trophy, as well as the Wee Auld Mug for the previous week. 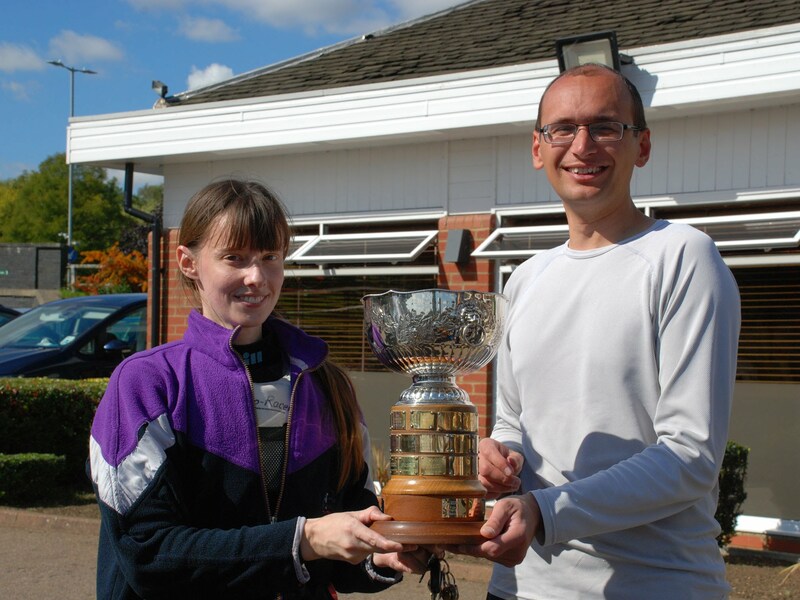 She also beat all comers for the afternoon Summer Regatta Pursuit trophy - a clean sweep! 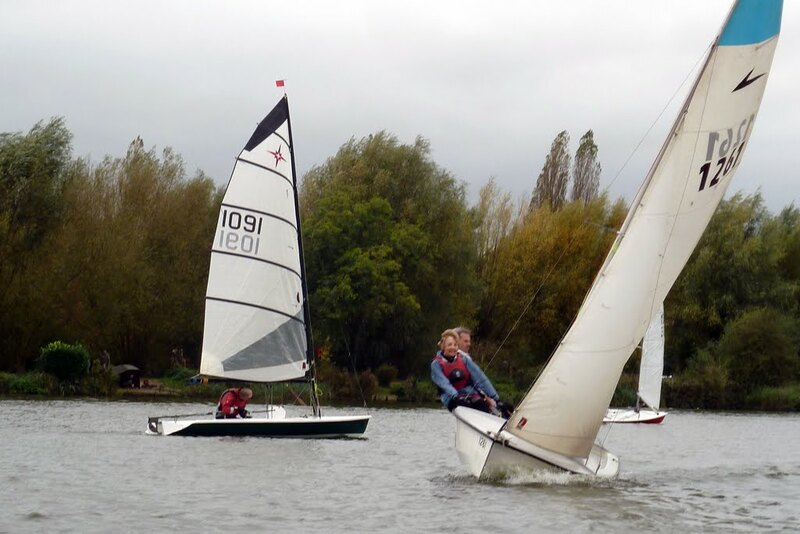 The 40th Anniversary Regatta was celebrated in true style with bunting, balloons, fruit punch and cup cakes. For a full set of photographs, see the slide show. pirates in this year's RTI Race which takes place on 1st June. His crew of heavyweight hearties are all members of the senior "Pirates" team at Welwyn RFC and they'll be sailing in Sea Fever, a Bavaria 36. 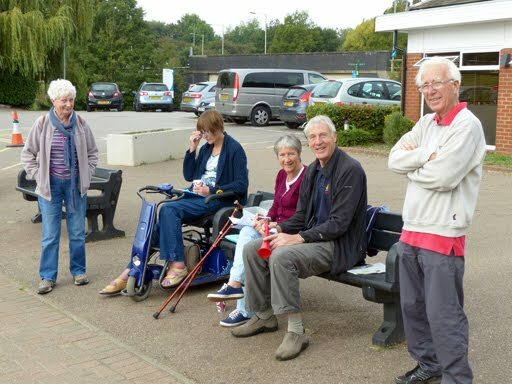 Here are some of them pictured at a recent photocall at Stanborough Lake. Good luck Barry. Don't forget the parrot! Latest 21 May 2013: Barry: " I'm just doing the planning using various sources of info. A quirky course with gains on the south of the IOW close to St Catherine's! Just waiting for the weather reports so I can plot course and taking account of anticipated timings. " Great weekend. 25th out of 38 in our group. 9hrs 23mins. One spinnaker hoist last night then for real. The guys did so well. Literally saying hold on to that till it gets tight then let it out or let go. Force 5 most of the way. 10kts boatspeed plus!! What kept them? Sir Ben Ainslie did it in 2hours 52 minutes! He shaved 16 minutes off Frances Joyon's record time which had stood since 2001. He was sailing in a 45ft America's Cup catamaran JP Morgan BAR. the 2013 RYA Youth National Championships at Largs, Annabel Cattermole (who competes as Welwyn Garden City SC) and her crew Bryony Bennett-Lloyd, have won through to become the top girl champions in the 420 Class. They finished 3rd overall and their performance included a race win and a number of top three finishes. At the prize-giving, selectors for the RYA Volvo Team GBR - led by Double Olympic gold medallist Sarah Ayton OBE - announced that the two girls will be among the 12 sailors who will represent Great Britain at the ISAF Youth Sailing World Championships 2013 in Limassol, Cyprus in July. 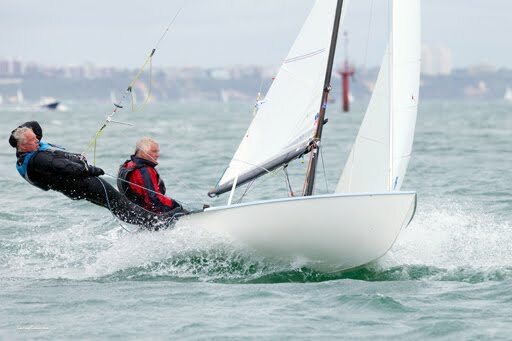 They will help to defend the ISAF Youth Worlds Nations Trophy which RYA Volvo Team GBR won last year in Dublin Bay and take the next step to their Olympic dream. “It’s a fantastic feeling, we have been working towards it for two and a half years and it’s finally come round and we are really excited,” said Annabel. Her crew Bryony added: “Watching the 2012 Olympic Games in Weymouth and Portland this year was really inspiring and to think that might be us in several years’ time as we are following in Olympians footsteps is unbelievable. 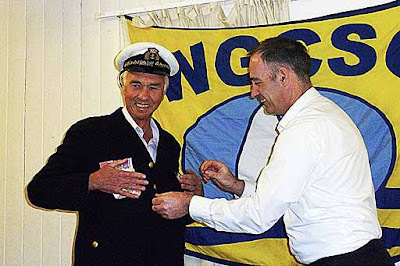 Peter Thornley was voted in as WGCSC's new Commodore at the AGM. The official hat and jacket was handed over with due ceremony by Shaun Smale, the outgoing Commodore. 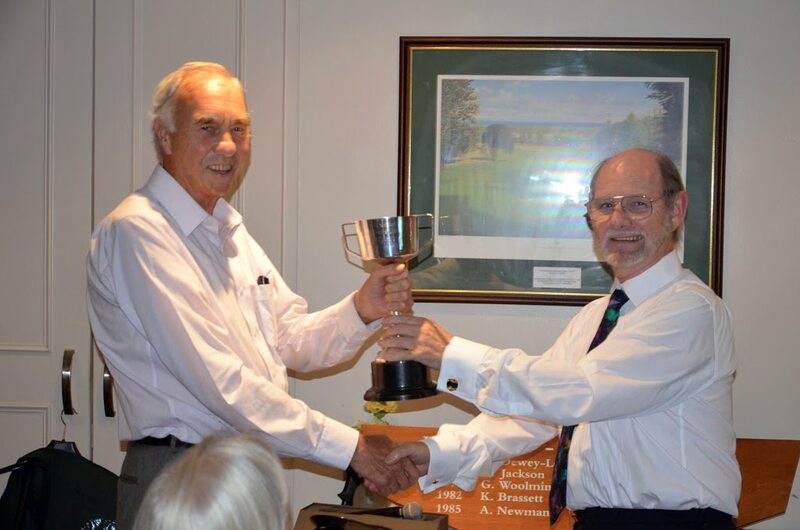 Peter later presented Shaun with an engraved tankard and framed photo to say 'thank you' from everyone in the club for all he had achieved during his four years in office. 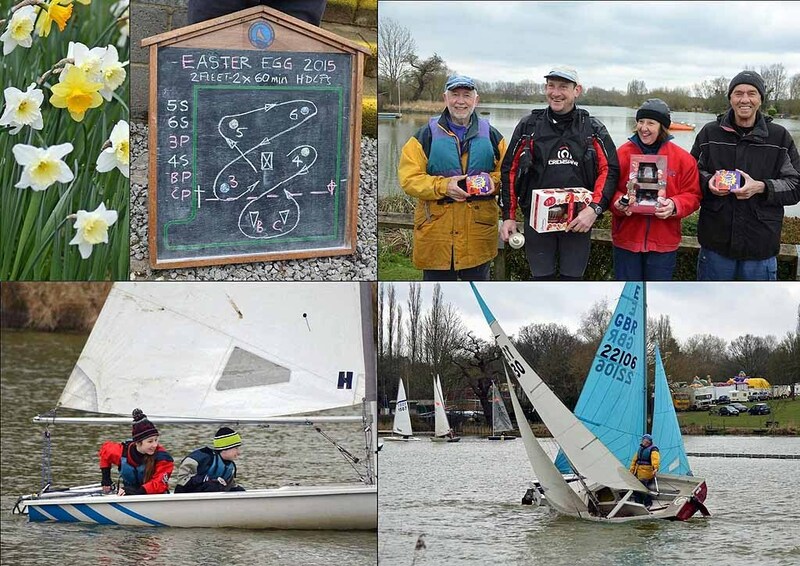 The winners of the Fast and Slow Fleet races battled it out in a sail off in RS Fevas to win this year's Easter Egg Trophy. Roger Morse (FF) was well placed at the start, while Sheila Stowe (SF) uncharacteristically found herself at the wrong end of the line sorting out a line problem. When the hooter went Roger took off like a greyhound, and Sheila had to set about catching him up. He sportingly "waited for her" at the top mark but then sailed home to win by just half a length. Another lap and who knows?! 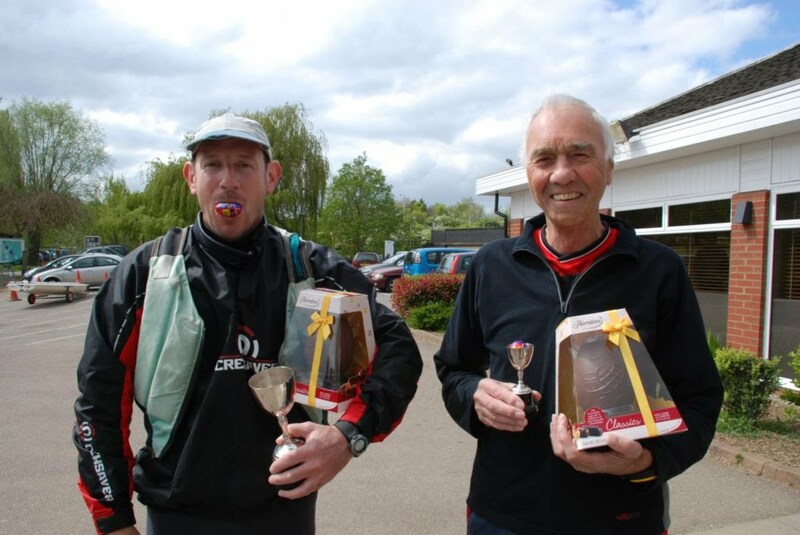 Charles Adams was runner up in the Fast Fleet and Pete Thornley was runner up in the Slow Fleet - both received Easter Eggs. All the other sailors and Mouse Club members received mini eggs. 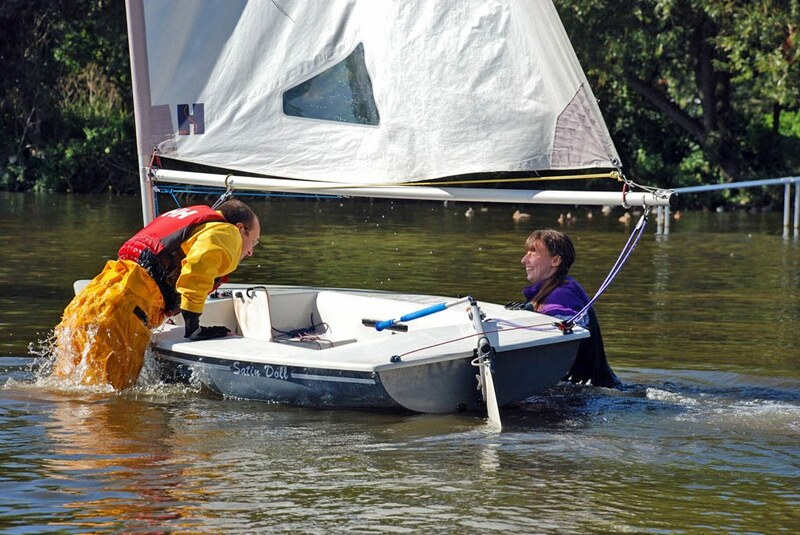 Thanks to retired Race Officer, Ray Wilson, who ran the racing, and Tim Hogan for manning the rescue boat. Capture the atmosphere here !! Annual General Meeting and Party. As published in the March Windsock, this will be at the usual place, Mead Hall, Wheathampstead on Sunday 24 March, at 7.00pm. Mead Hall is along the lane behind the Bull Pub. Park in the public car park, behind the Pub car park. Finger buffet, free drinks. Small entrance charge. Note this year there will be changes to the Committee. Commodore Shaun Smale, Race Officer Ray Wilson, and Committee Member Mike Caddy are standing down. We already have a nomination for Race Officer, and after a shuffle of the existing Committee members to cover the Officer Posts, we will need 2 more members. So if you are willing to help the club, please consider volunteering for committee. This year's Welly Challenge held on February 9th was a roaring success and raised £186 for the Hertfordshire Society for the Blind - see letter. To say it was a totally surreal affair is an understatement. Master of Ceremonies, Roger Morse, took The Queen's Diamond Jubilee theme to another level when he set a quiz based on corgi breeds, invited the two teams to give a corgi grooming demonstration, and then gave out thin balloons and challenged them to make a buoyancy aid for a corgi. Unperturbed, Wellys rose to the challenge and a lot of laughs were had by all. The evening was also a very colourful affair with everyone either wearing a homemade crown or 60's fancy dress. The Wellys who came in costume - Thelma (Cilla Black), Marjorie (Sandy Shaw), Charles (Acker Bilk), Sheila (Olivia Newton John), Tony S (John Travolta), Pete T (Acker Bilk), Sybil (Hippie), and new member Tony Gale (Freedom Man) - were all brilliant and hilarious at the same time. In Marjorie's case, she was totally unrecognisable in her wig and micro mini dress. The scoring was random, the judging anarchic, but the eventual result was a win for the Starboard side representing the slow fleet. It was freezing cold and bleak outside the Mead Hall, Wheathampstead, but inside, it was one helluva night, thanks to Roger! Select here for a full slideshow. THE ICE HAS GONE !!! See the favoured HIKING positions to keep out of the chilly water!! SPECIAL STOP PRESS: In addition to the best Pop Look-alike Fancy Dress, please bring along an appropriate CROWN, decorated as you wish!!!!! 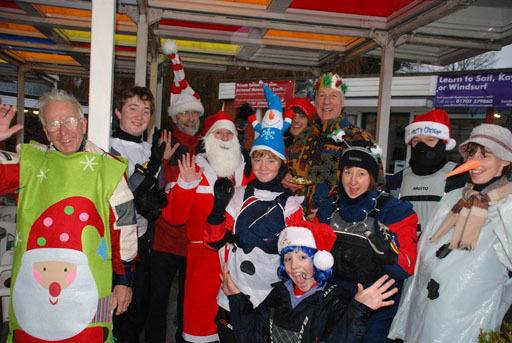 Here's a festive pic taken at the 2012 Christmas Pud Regatta. 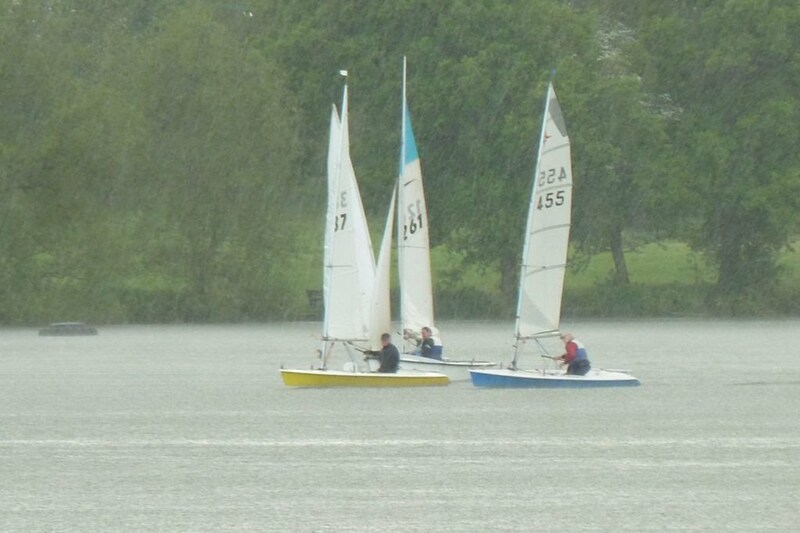 Heavy rain did not deter our intrepid sailors and 14 boats took to the water to compete for the puds. Winners: Fast fleet - 1st Peter Edel, 2nd Brian Cardinal. Slow fleet - 1st Annette Edel, 2nd Sheila Stowe. Everyone enjoyed hot mince pies and mulled wine after the racing. Fancy dress winner is still to be announced by the race officer! And here's a pic taken last year. Annabel Cattermole and Clare Bennett-Lloyd have just returned from the Imperia Winter Regatta in Italy where they won the event. Mike Cattermole reports that Annabel and Bryony got the Open prize, and the Junior prize (U18). They beat the current ISAF World 420 champion, the same Italian boat which was 5th in the Open Worlds, and which was also 2nd U18 boat from just a few months ago. They also beat quite a few other top class boats in a highly competitive field. A couple of weeks previous to this Annabel and Bryony had won the end of season, not only winning the ladies, but also beating all the boys. In Sept they had won the Inlands (ladies) as well. All in all a very good few months. They are now truly up there competing with the best in the world. October has been a busy month with very changeable weather! Some days gave us lively sailing while others were very gentle!! Below you see a "FLY PAST" at the Commodore's Cup and an early morning view of Stanborough caught by our hawk-eye photographer, Val. A slide show of photographs can be found here. Are YOU in one of them? 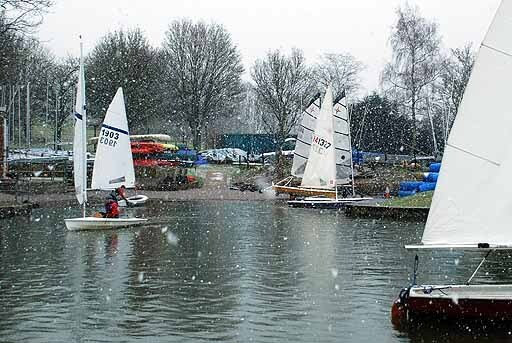 Once again, the Sailing Section of Stewartby Water Sports club hosted our awayday, which again was very popular, giving us a chance to sail on a large open stretch of water. The format was slightly different this year. SWSC were also holding an Albacore Open meeting and the interclub challenge races between the hosts and us were added on to the 2 afternoon Albacore races, using the same course , but starting 6 minutes later. There were 16 in the interclub races, including 8 of WGC. The wind was around force 3, with some gusts and shifty bits (technical term!). Once again the experience of the hosts on their own water counted, and they won by 14 points to our 22, counting the scores of first 4 boats from each club. However, we had some excellent performances. In particular Julian Gunnel took 3rd , and Dave Campbell took 4th. As well as the racers, we also had 4 ‘leisure’ sailors, and about 8 supporters, so a very good turn out of 20. An expanded report can be found in the September Windsock. Photographs and full results will be published when available. 420 WORLD CHAMPIONSHIPS - ANNABEL and BRYONY do it again!! We make no excuse for reporting Annabel Cattermole's and Bryony Bennett-Lloyd's continued success, this time in the 2012 World Championships and Ladies World Championships in Austria. They ended up 23rd out of 71 and 3rd GBR boat in the Ladies Gold Competition. They were lying 18th and 2nd GBR boat going into the final day, but they had one more race and most of the GBR boats struggled with the conditions, light and shifting winds. Anyway, they've come back really really pleased having had a great time. We give them our warmest congratulations. Club member Annabel Cattermole , with her crew Bryony Bennett-Lloyd, competed in the French National Championships, late July. 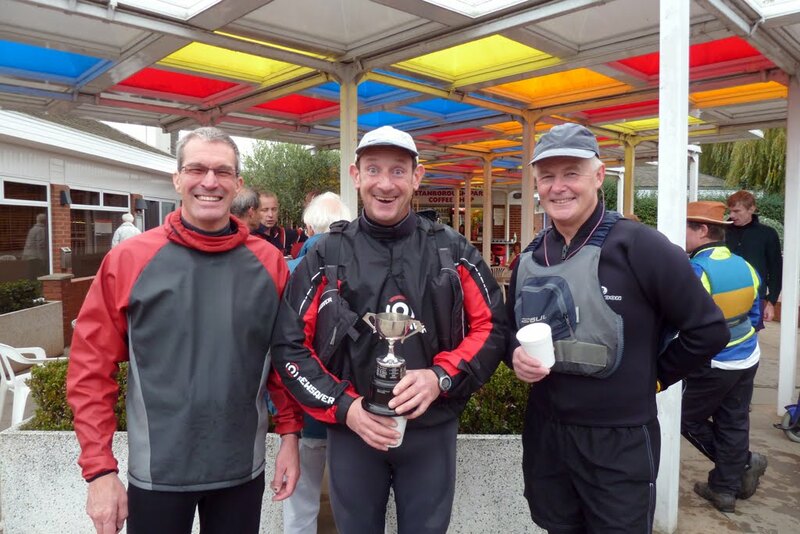 They had a brilliant series, finishing first in the silver fleet, and 46th out of 90 overall. Awesome sailing. Well done Annabel. See them in action and being presented with their cup here. More pictures of Annabel and Bryony here. 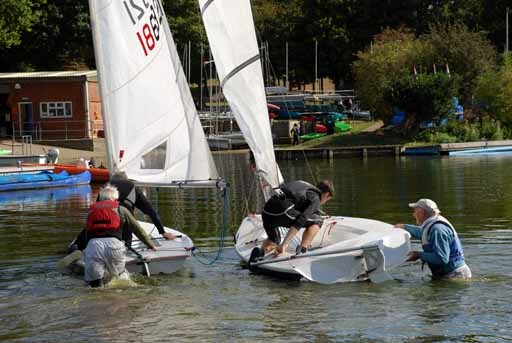 Photograph shows Paul at Hunts SC Open and he's off to the Nationals at Northamton (8-11 August). We wish him all the best! After 24 hours of sailing in the most hostile conditions, the Welly Youth Team won the Junior Silver Plate for the best placed junior side in the race. They also came 4th overall out of 7 teams, beating both junior sides and one of the Paxton sides. They won by 12 laps on the water (completing 107 laps, beating last year by far) but by only 1 on handicap. The team were: Matt (captain), James, Annabel, Elizabeth, Dan, Idris, Sophie, Abi, Sam and Phil. Tony Lyall was the team’s Mr Motivator! So many of the Youth Team participated that we never got them all together in one photograph. The weekend weather forecast could not have been worse. There were strong winds on both days and heavy rain fell throughout the night. The competitors had to summon up every ounce of energy to keep going. 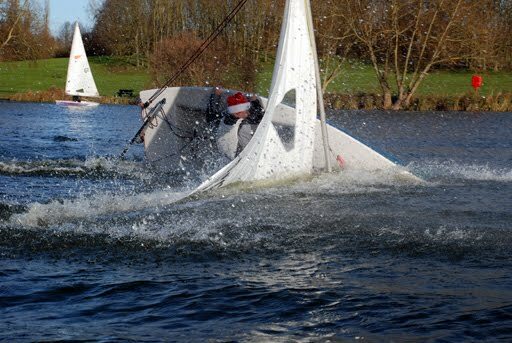 One of the lowest points was on Sunday morning when everyone had survived an horrendous night of rain, and suddenly heavy gusts started to hit the fleet and there was capsize after capsize. If you’d like to say ‘well done’ the best way is to make a donation. Sue Cory is collecting for the Youth Team. This weekend at Little Paxton, the Youth Fleet won the Junior prize (silver plate) for the best placed junior side in the race. As well as this, we finished 4th out of 7 teams beating both junior sides and one of the Paxton sides. We won by 12 laps on the water (completing 107 laps, beating last year by far) but by only 1 on handicap. The conditions at times were horrendous with very strong gusts in the last 3 hours of the race and very heavy and persistant rain over night. I would like to thank on behalf of the Youth Fleet all the members who came along to support us despite the bad weather and a trip up to Paxton. 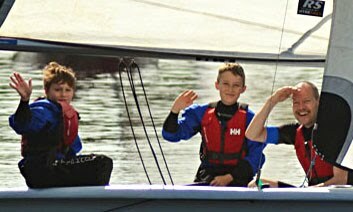 Sailors in WGCSC Youth Fleet have set up a Facebook page so they can keep in touch. This was last year ... now it's time to get geared up for Little Paxton 2012! The Regatta ended with a sail off between Peter and Annette in matching Q'bas. Peter's 'decisive moment' came at the end of lap 1 when he rounded Mark C ahead of Annette, and after that she never caught up ... but she did win last year. He is pictured here with just some of his trophies. The new web site you see before you was officially launched at the AGM on April 1. It was developed by Patrick. He's done a wonderful job and is keen that the new look encourages members to become more involved. A sub committee was formed consisting of Shaun, Patrick, Val and David and they have been working on the format. 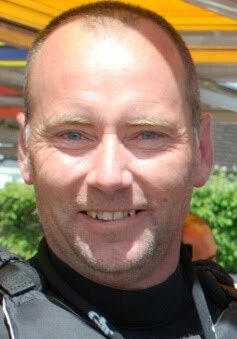 David will be looking after technical matters as Patrick has stood down from the role of Webmaster. 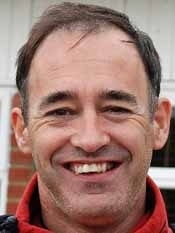 He has worked extremely hard and enthusiastically on behalf of the club and we all owe him a great debt of gratitude. Please pass on your compliments to Patrick! The sun shone on Saturday 24th March and everyone had a Welly good time including a fisherman hoping for an early tan. Charles, Sheila and former Welly Paul are just back from a week of race training on a Sunsail f40 on the Solent, organised and led by Barry. They shared the fun with a contingent of Stanborough Park instructors. Finesse senior instructor, Sarah Elliott, has put together a fantastic video which captures life on board. Due to high pressure, maximum wind strength only reached force 3, but it allowed the crew the chance to put up the massive spinnaker under controlled conditions. Full story in next WINDBAG. 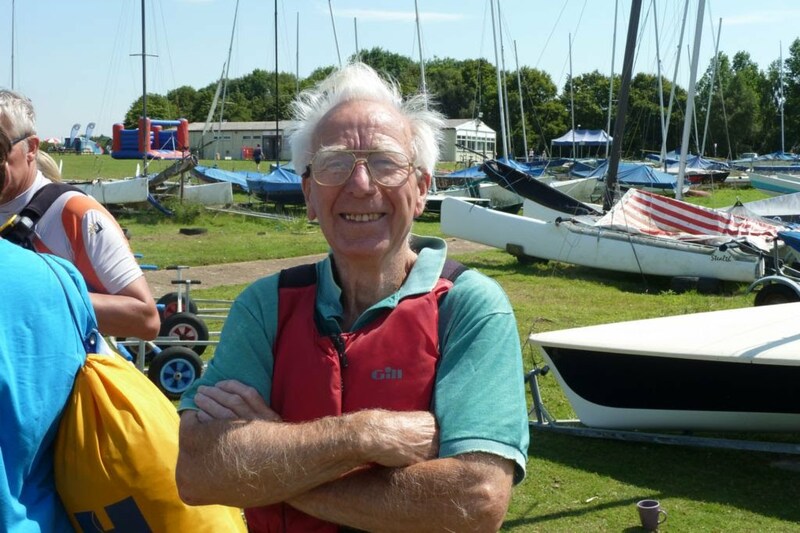 See video on You Tube "Yachting 2012"
Dave was given a rousing cheer when he turned up for sailing on Saturday March 17 after a six month absence due to a back injury. He got into his Supernova at the start of the first race and just took off. Afterwards he said he felt fine and revealed that he has been getting fit by doing 40 press-ups every morning before breakfast!